Part One, Part Two, Part Three, Part Four, Part Five, Part Six, Part Seven, Part Eight, and Part Nine. Updates Wednesdays! 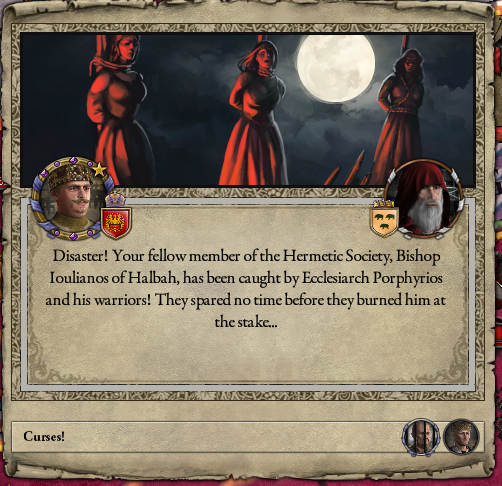 We left off with mad Emperor Ioseph the Wise having just conquered France and receiving new cures daily from his crazed dwarf doctor. Onward! 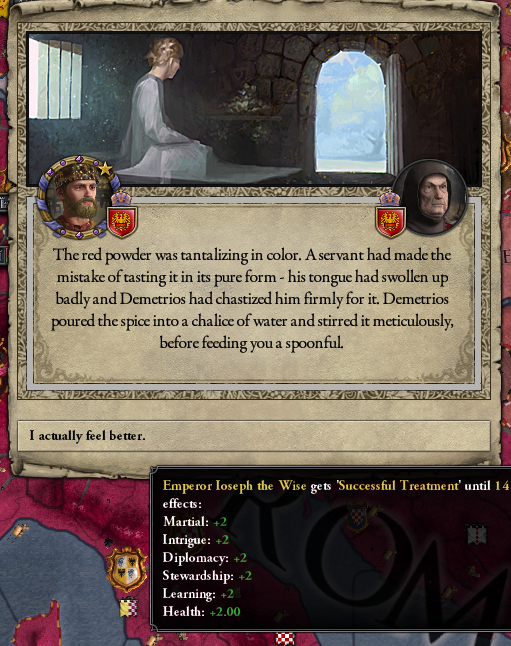 He must have mixed the red powder better this time, because it actually works. 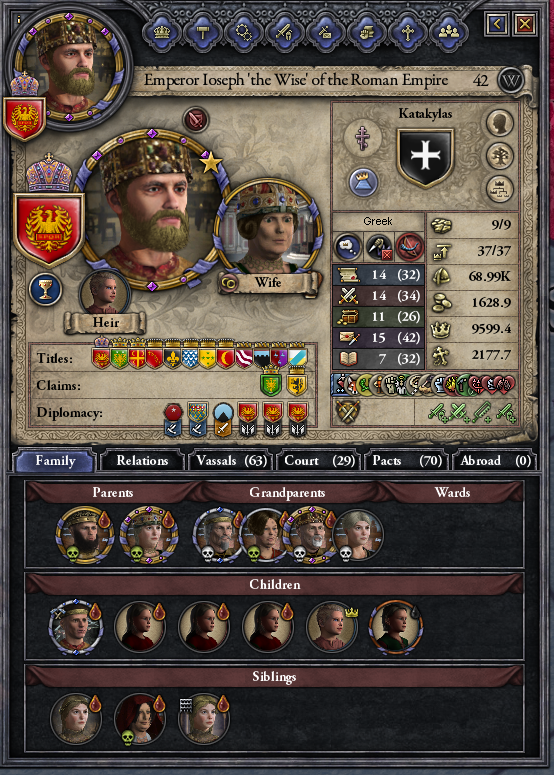 My heir Ioannes has survived consumption, thankfully. At age eight he’s looking pretty good. 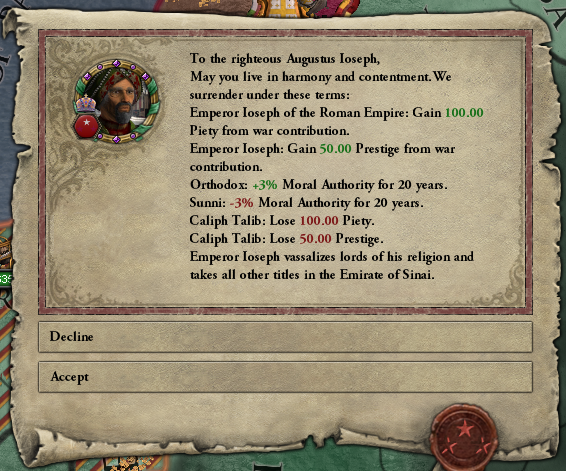 I launch a war for the Sinai. At this point, every war means fighting the entire world, and at first things go rather badly as poorly-defended frontier castles fall to the allies. At 42 Ioseph is an extremely solid emperor with middling-to-good stats. 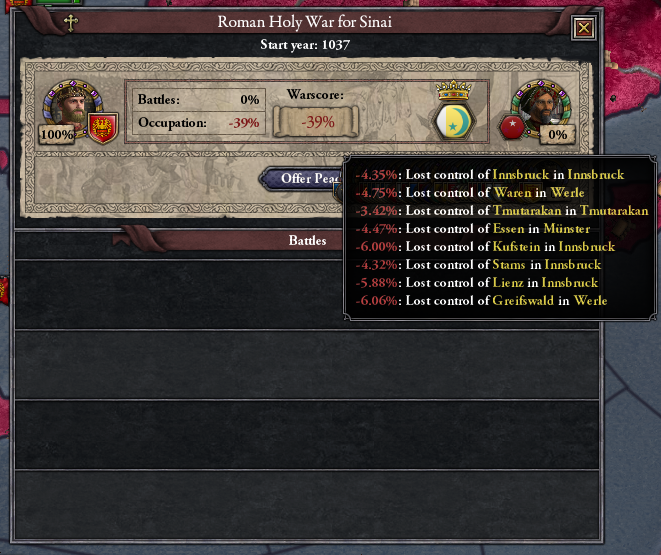 As I transition to ruling the Roman Empire, stewardship has become less important, since my personal demense is a tiny minority of the realm as a whole. 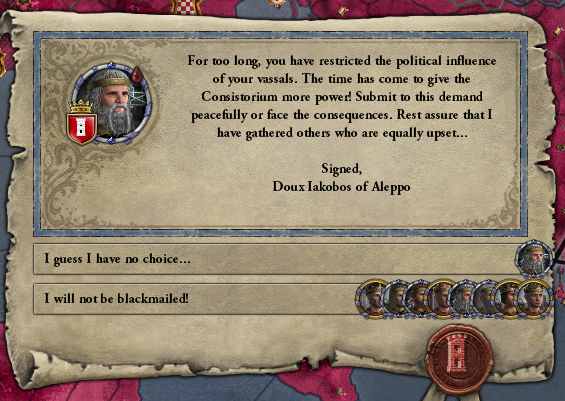 Diplomacy is now more critical because it affects my vassal limit and relations with the lords. Iospeh is (deep breath) shrewd, Augustus, brawny, zealous, charitable, paranoid, craven, cruel, lustful, humble, possessed, lunatic, and consumptive. With a demonstrated ability to win wars vs. the entire world, the only limit on my expansion is truces — after each war, there’s peace for ten years, unless one leader or the other dies. 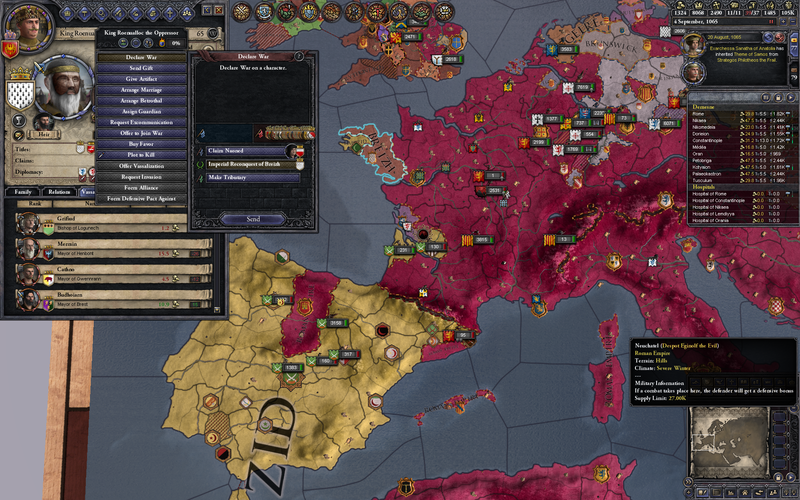 I pick off smaller realms like the Taids while waiting out truces with my largest enemies: the Muradids in the east and Hispania in the west. This is weird. 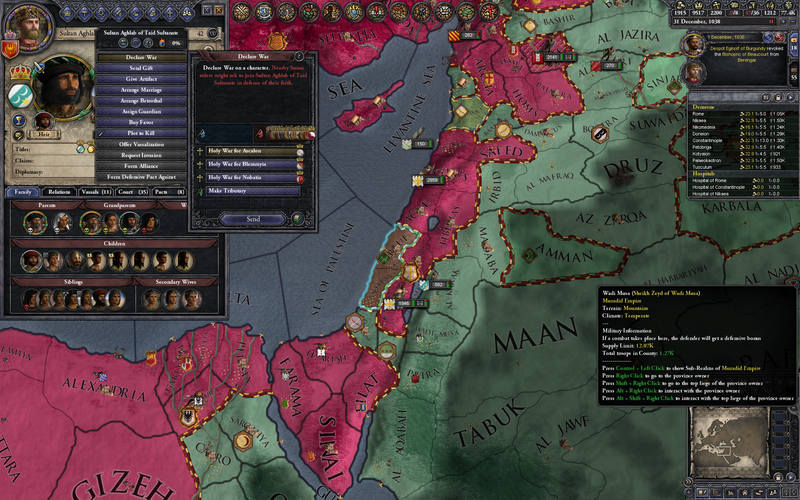 So there is already a Kingdom of Jerusalem, and one of my vassals is king of it. 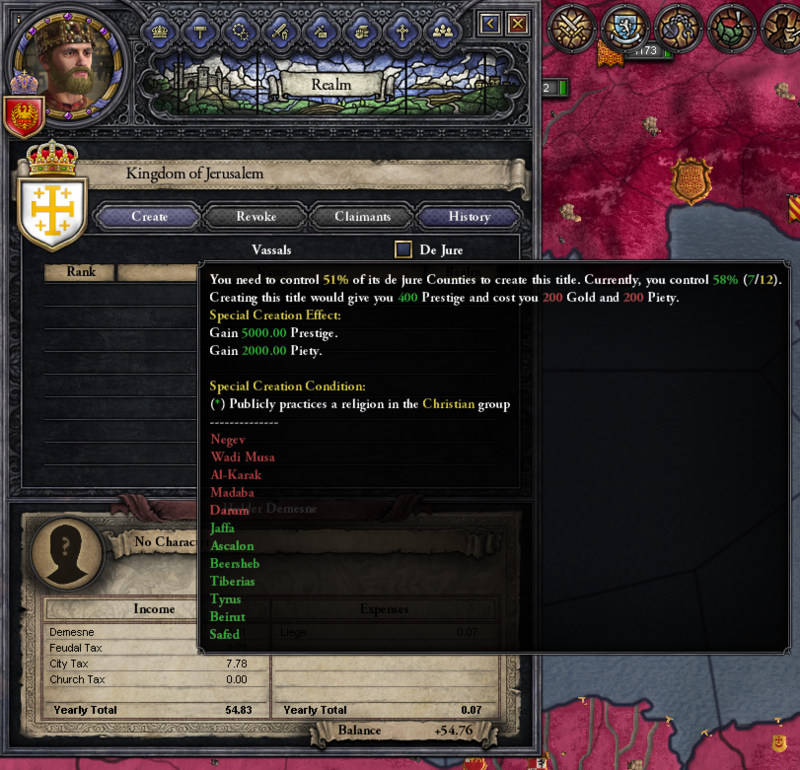 However, as a Christian, I can create a special Kingdom of Jerusalem, too? 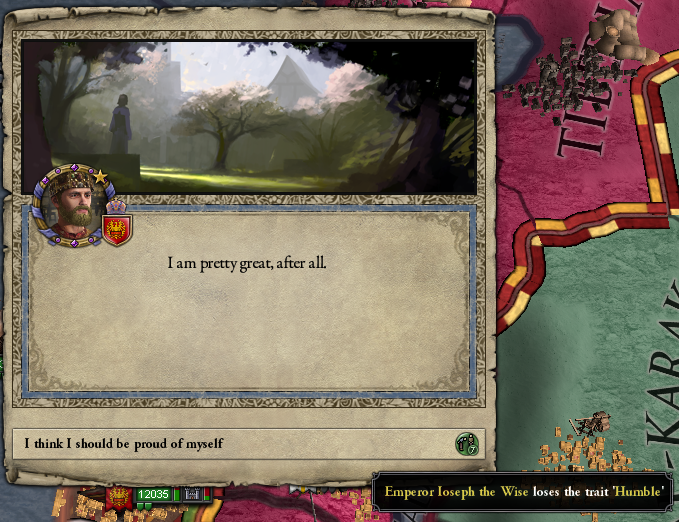 It gives a massive amount of prestige and piety so I do it and award it to the same guy. 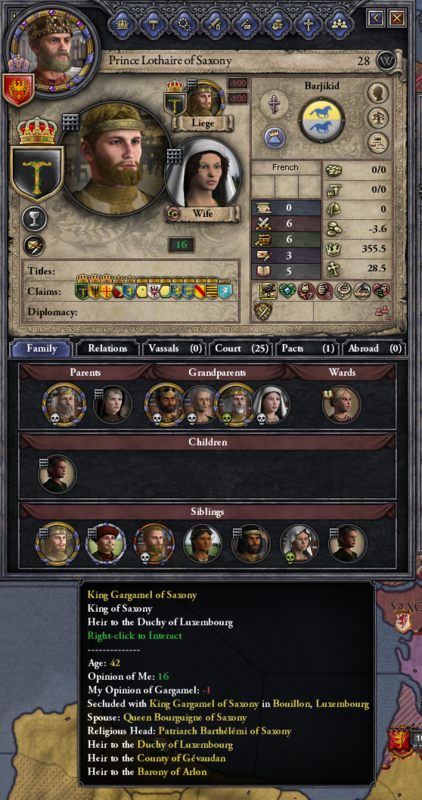 He’s double-king now! 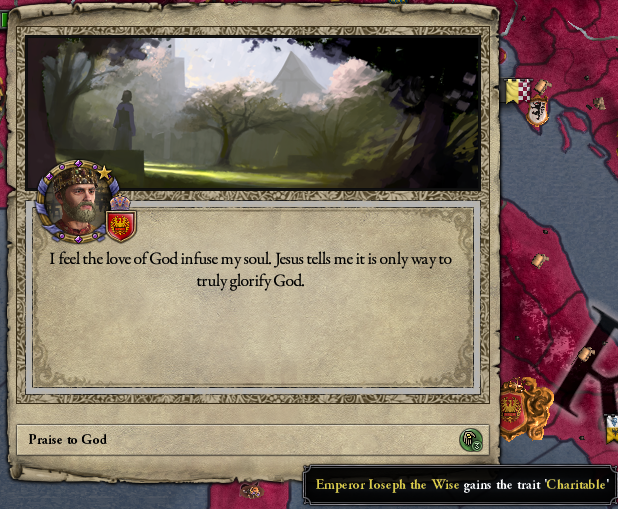 This apparently causes the Lord to take notice, because next thing I know I’m being negged by Jesus. 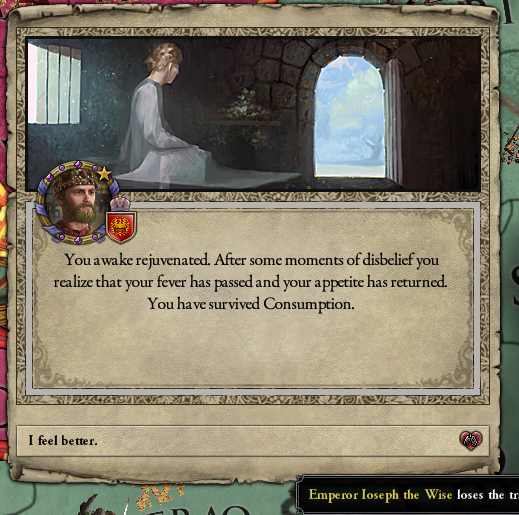 On the plus side, after literally decades, my consumption has been cured! 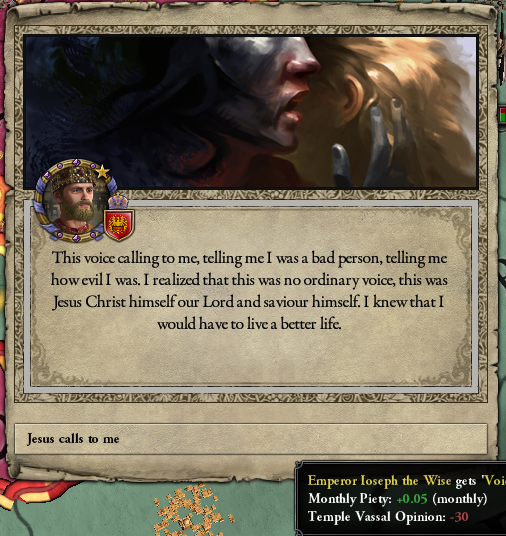 Praise the PUA Christ! 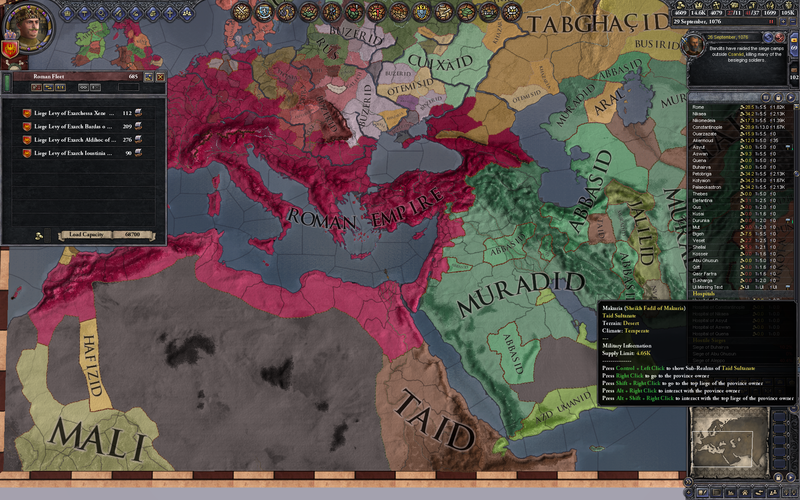 While in this timeline the Arabian Empire has never truly collapsed, it does undergo periodic crackups and reconsolidations. 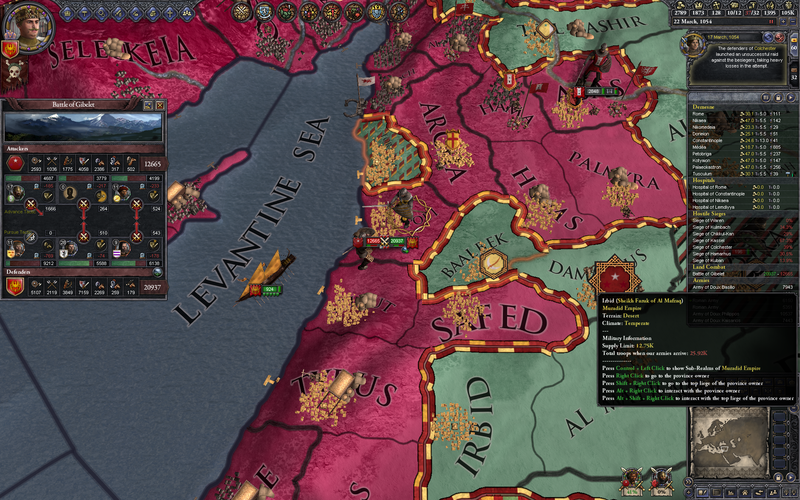 These are opportunities for me, since I don’t have peace treaties with the rebels, so I can grab territory off them. The voice of Jesus has tempered Ioseph’s zealous cruelty. Making progress! 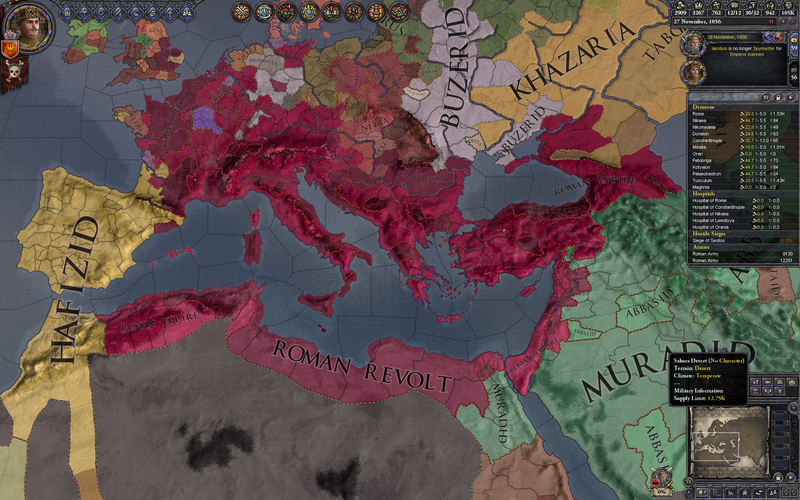 Gaul is still pretty ugly though. 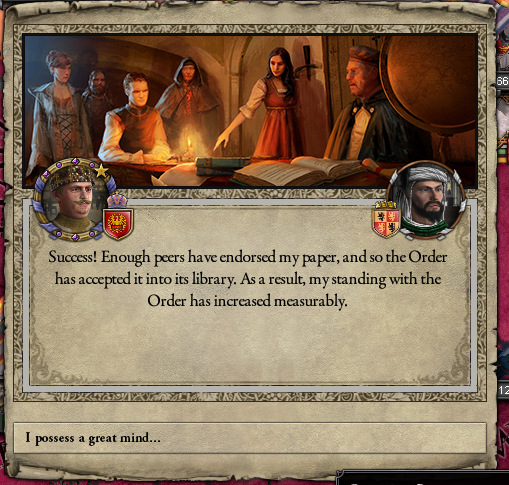 Through the usual means of bribery and packing the council with my toadies, I have achieved absolute rule. Soon the council will be abolished, and the last vestiges of the Old Republic will be swept away. Fear will keep the local vassals in line. Fear of my extremely overpriced assassins. 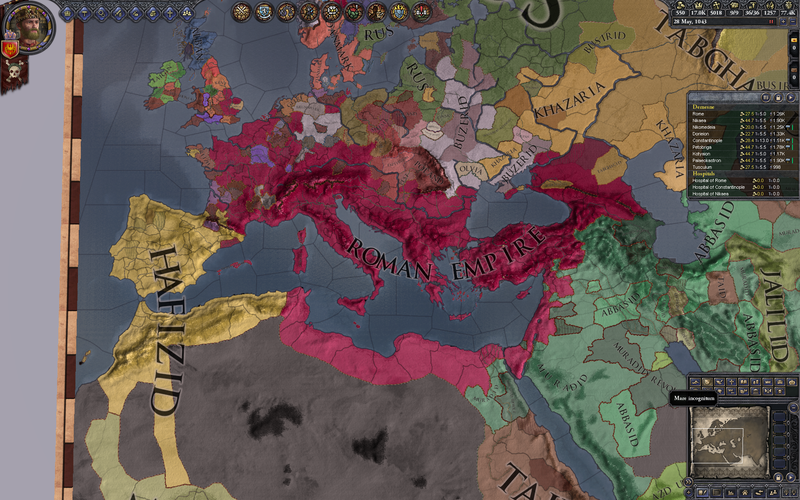 Hispania has become the Hafizids, but they remain my greatest obstacle, since a proper Roman Empire should include all of Spain. 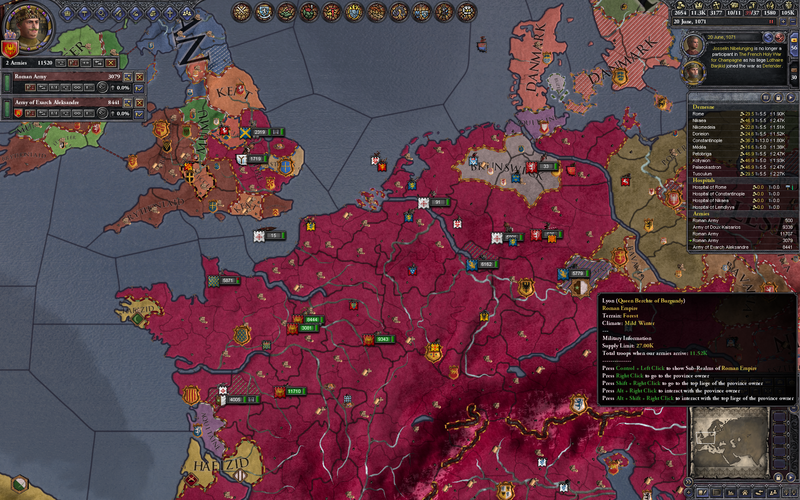 Also, my invasion of England has begun! Londinium is back under Roman control after six or seven centuries. 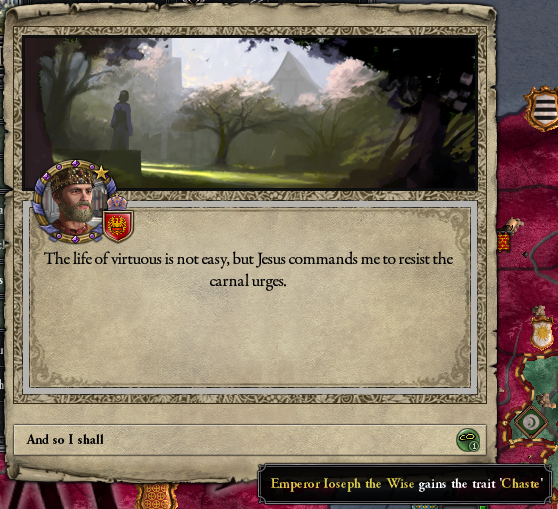 Jesus is still back-seat Emperoring. 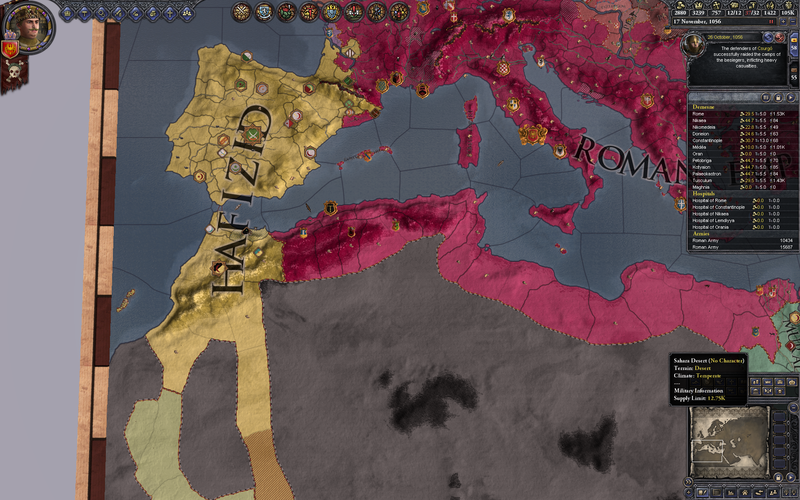 Whenever the truce runs out, my legions push west along the North African coast, taking it back from the Hafizids duchy by duchy. A second ancient province is complete! I’m not paying too much attention to these for now — I’ll clean up the bits later once I fill in the broad strokes. 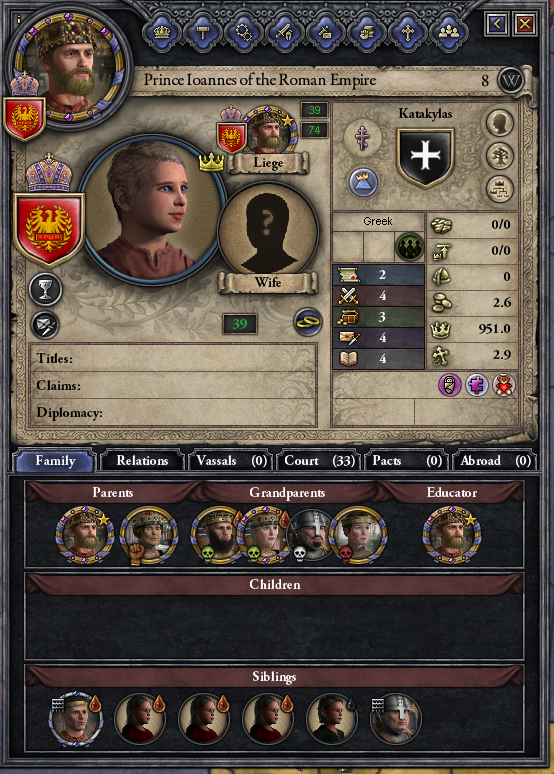 My heir has come of age, and he’s quite good! 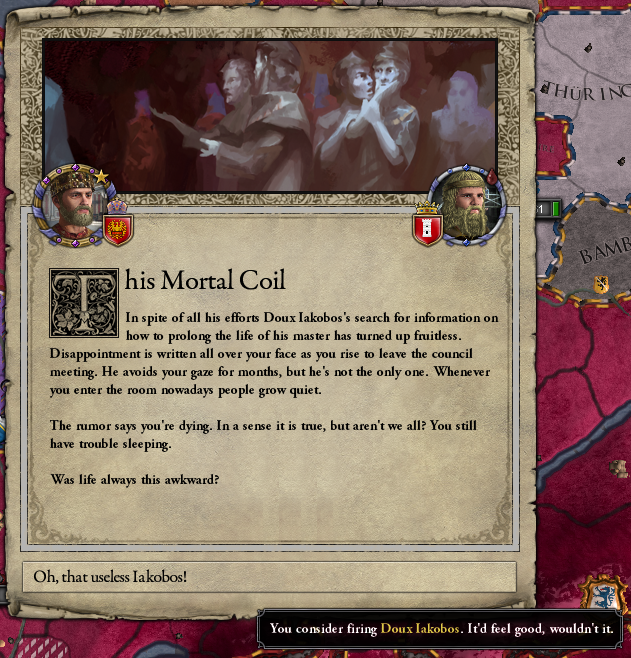 Unfortunately he hates me, because he’s ambitious and that makes me his rival. 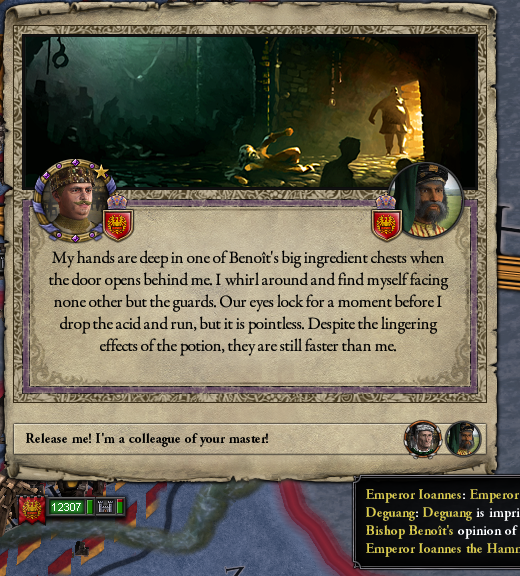 Well, bring it on, son! 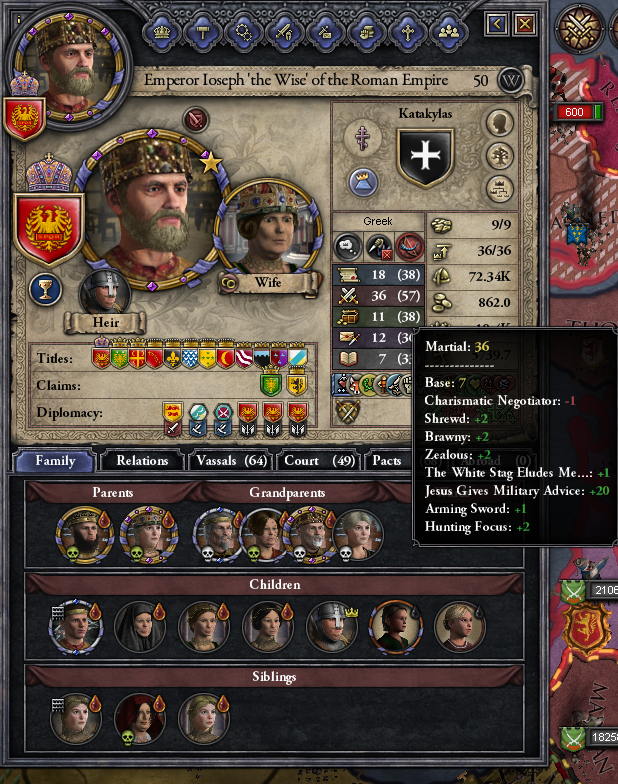 With Jesus’ help, Ioseph has lost craven, and his stats are edging up into “great” territory. 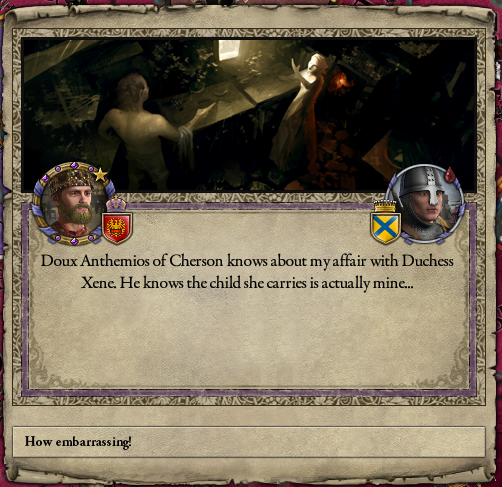 He did, um, seduce the 17-year-old wife of one of his cousins. Sorry about that. Fortunately any problem can be solved with a large enough sack of gold! 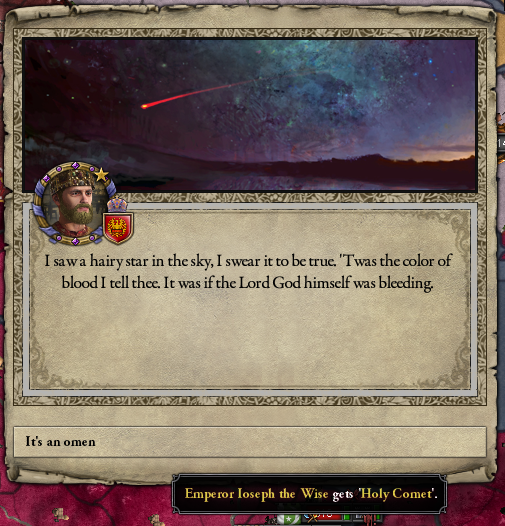 Bloody comets are considered a positive sign, right? 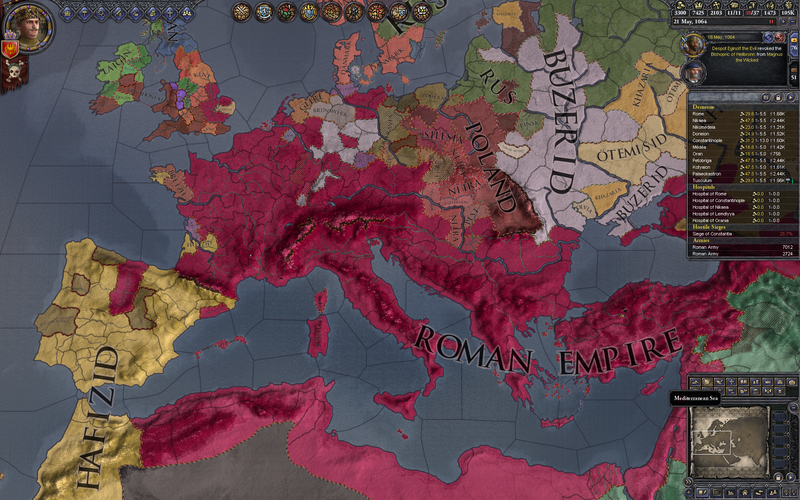 It’s time to clean up Gaul. 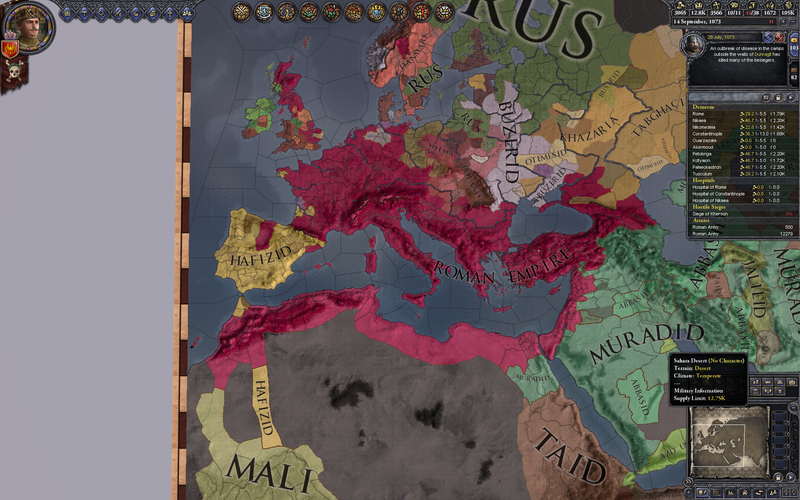 I’ve picked off most of the small realms, so now I start on the bits held by other Christian kingdoms, using the Imperial Reconquest cassus belli. This apparently pleases the Lord, because Jesus starts dishing out the dirt. 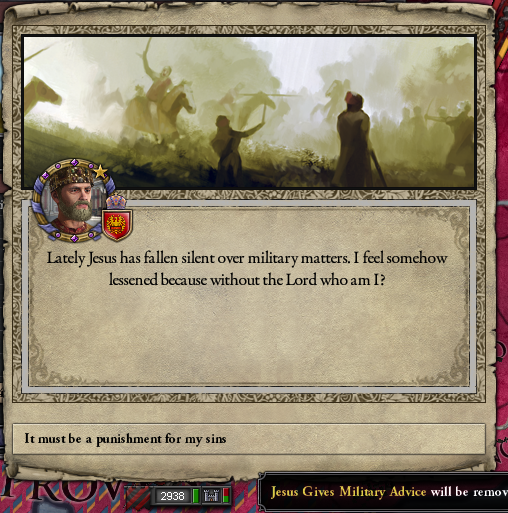 Who knew Jesus was such an awesome general? 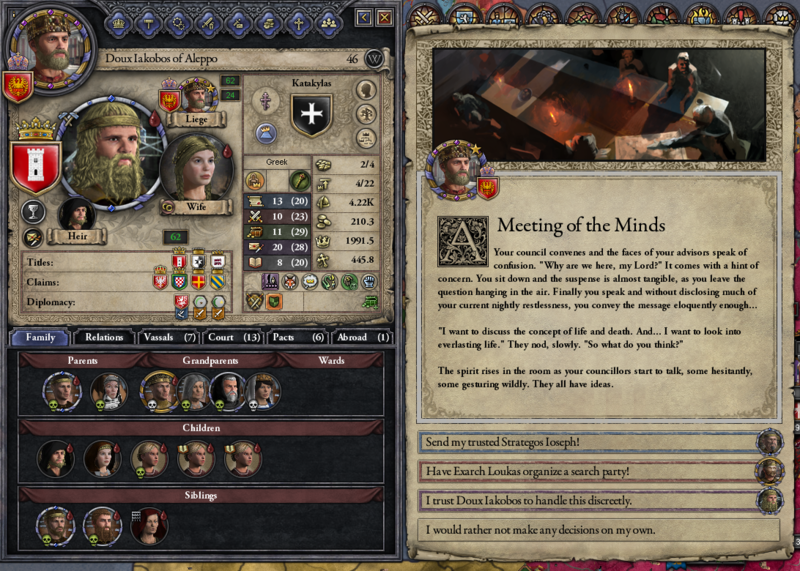 So, at fifty, with Jesus’ help, Ioseph is a reasonable diplomat and steward and the best general who has ever lived, far above pikers like Genghis Khan and Ottar the Unspeakably Vile. 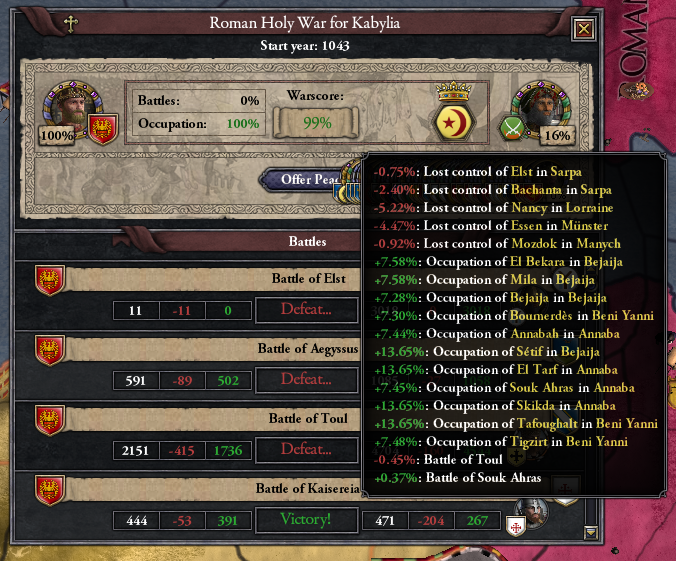 Predictably, my wars go well! 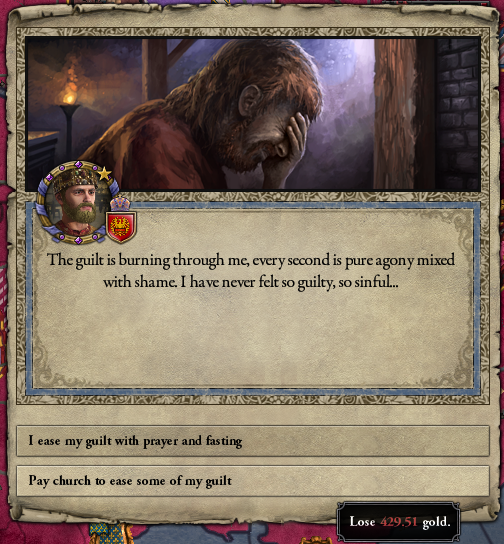 A little charity is a small price to pay for Hax Jesus. 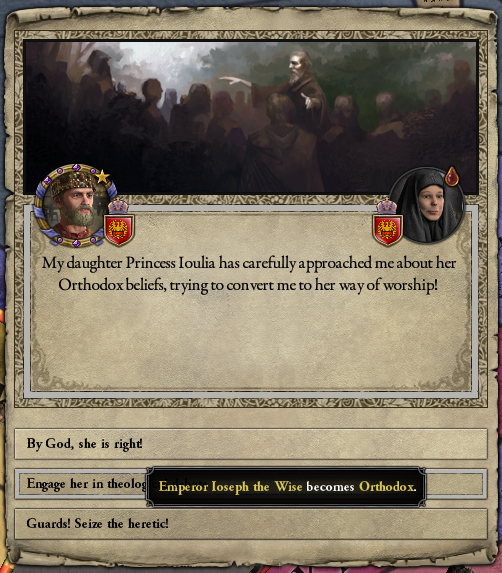 Fortunately my daughter is able to talk me back around to Orthodoxy. Jesus also tells me to stop sleeping around. 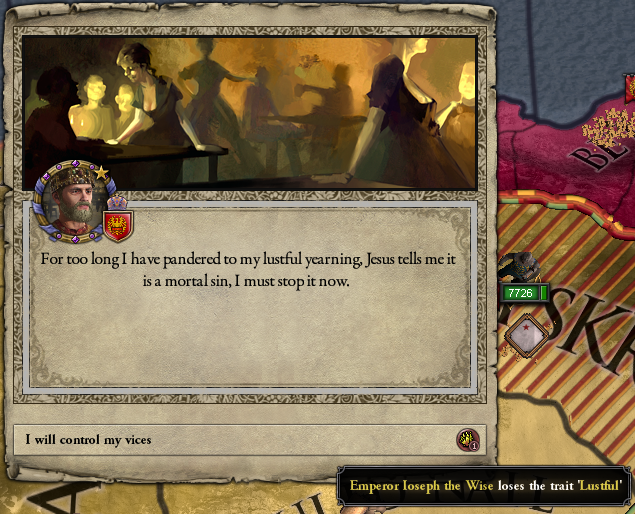 Man, why are you such a buzzkill, Jesus? Can’t argue with results, though. Look at that martial! 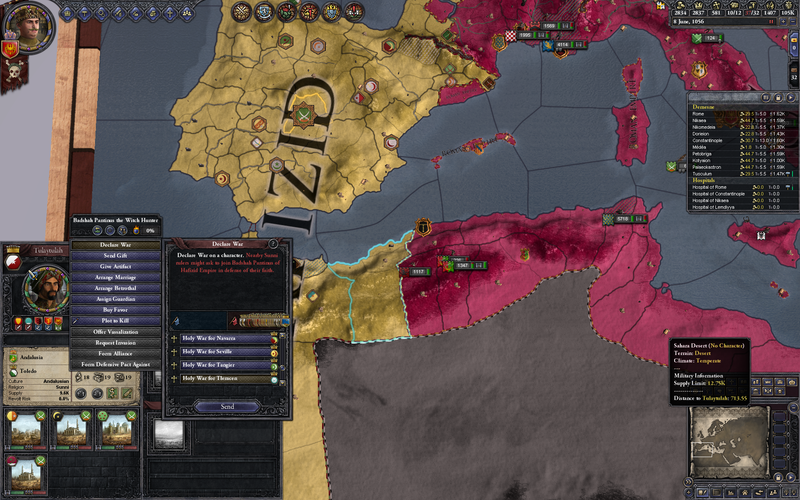 The North African frontier takes another lurch westward. 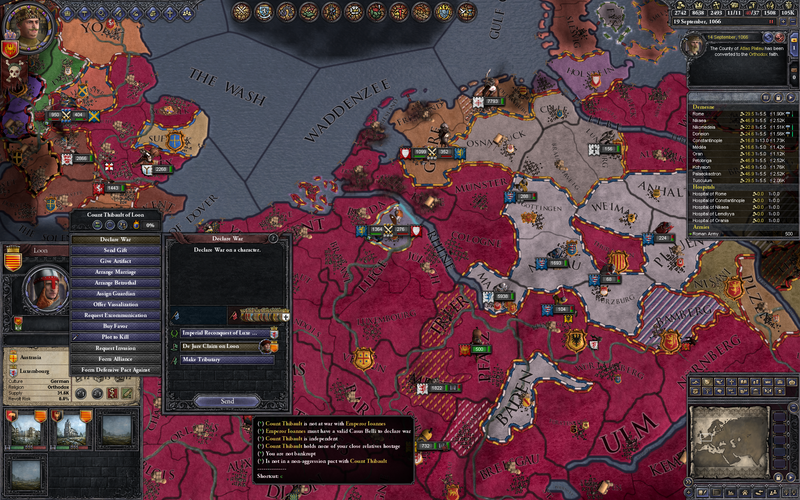 Saxony holds an annoying amount of widely-separated land, making reconquest slow. 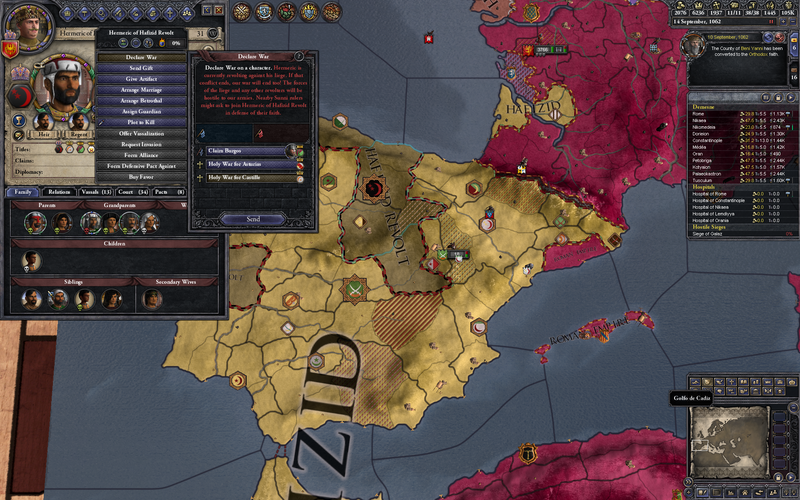 Fortunately this guy a) is the younger brother of the king and b) despises his brother with the fire of a thousand suns, making him willing to join my court, be appointed King of Aragon, and then launch a bid for the Saxon throne. 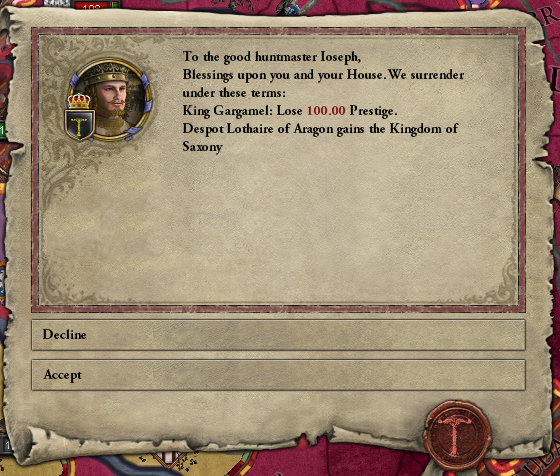 Noooo lord why have you abandoned me! 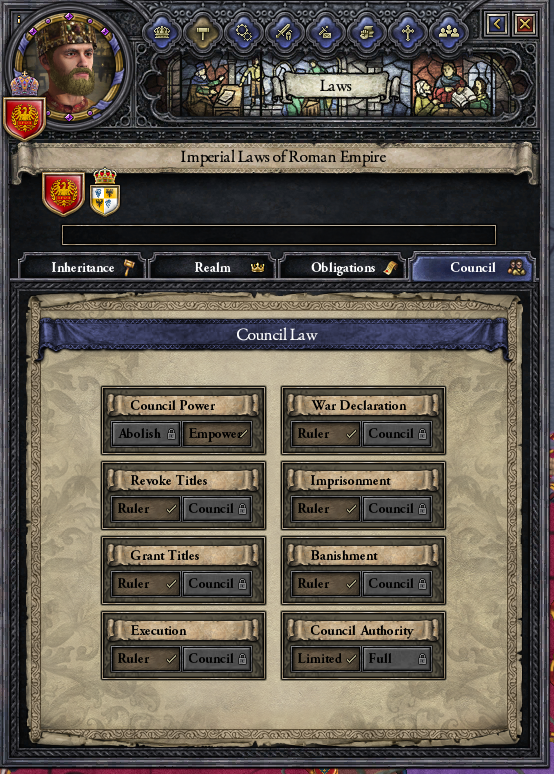 Now all I have to rely on is my crushing military superiority! Fortunately, that’s enough. 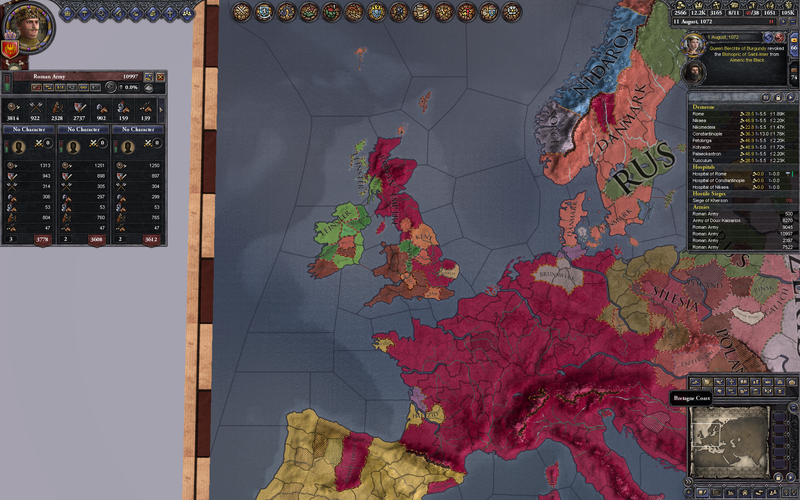 Another chunk of France and Germany comes under my rule. More progress. France is much tidier. 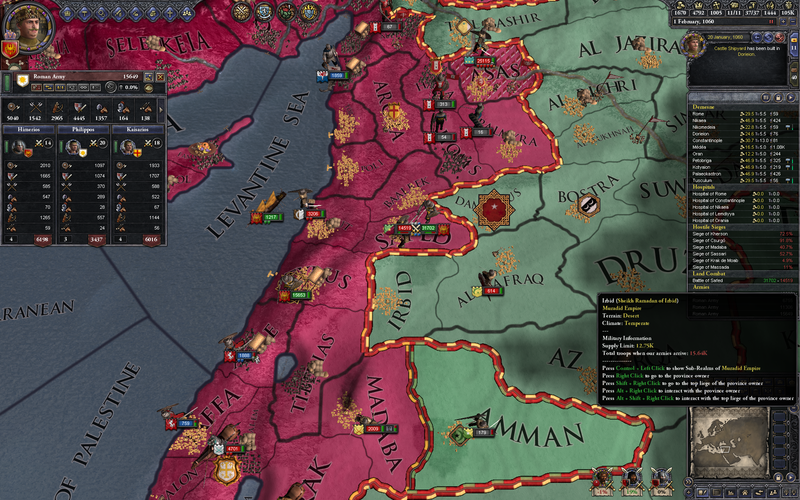 My vassals can make headway on their own against the smaller states in the north-east, but only the might of the full empire can take on the Hafizids. 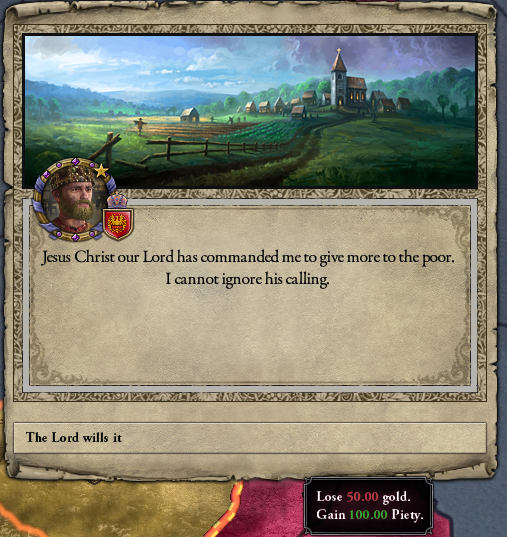 What’s that, Jesus? I should stop boning entirely? Yikes. 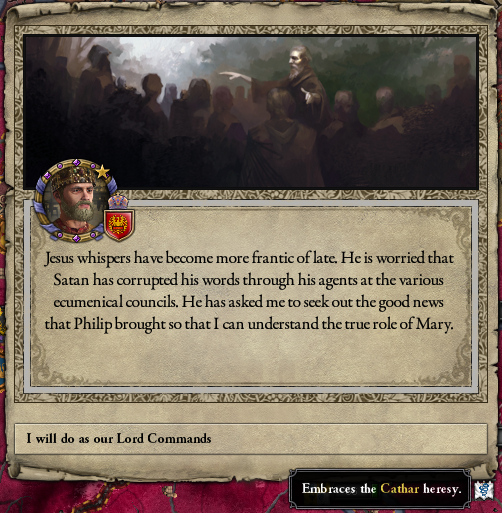 This apparently spurs Iospeh into the decision that he doesn’t want to visit the kingdom of Heaven yet. I’d be quite happy for him to live forever, he’s pretty awesome. 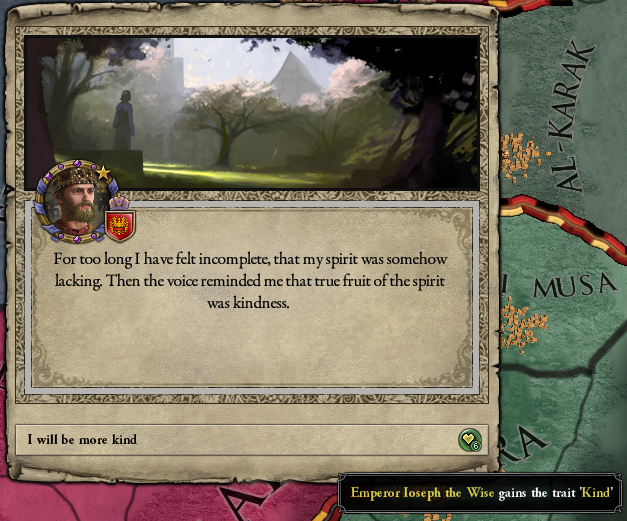 I send out my spymaster, since he’s ridiculously awesome at spying. 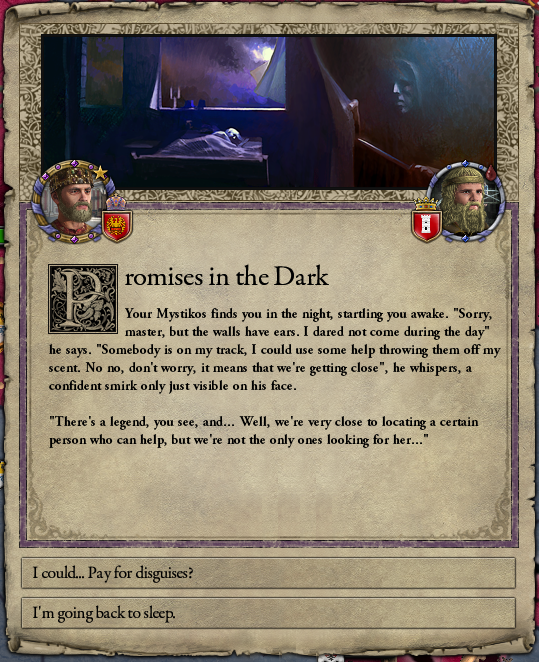 Did you really have to sneak into my room at night to ask for money? Whiiiich he promptly spends on hookers and blackjack. 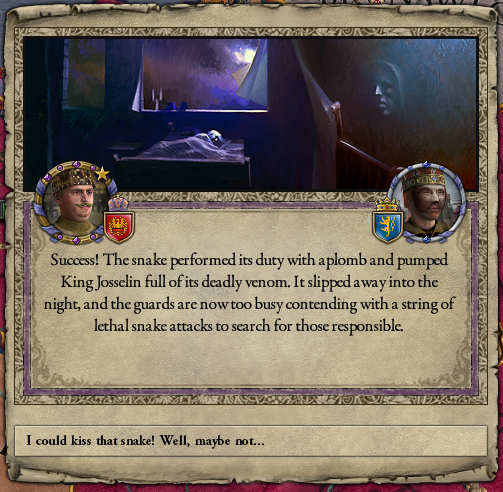 So much for that plan. 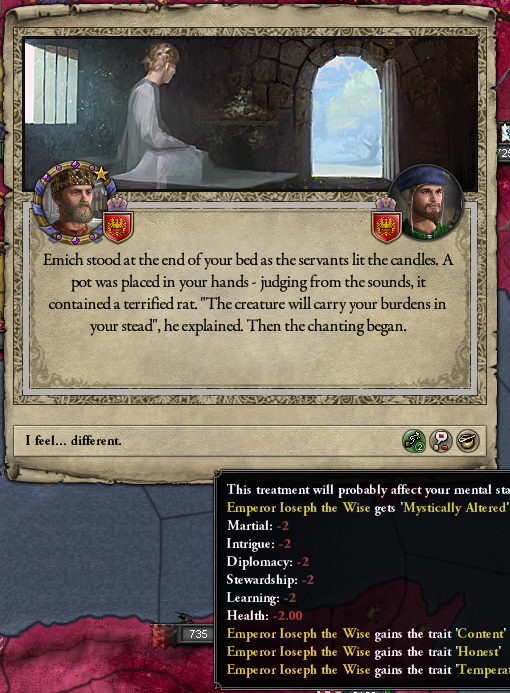 This heretical mystic is now my court doctor. 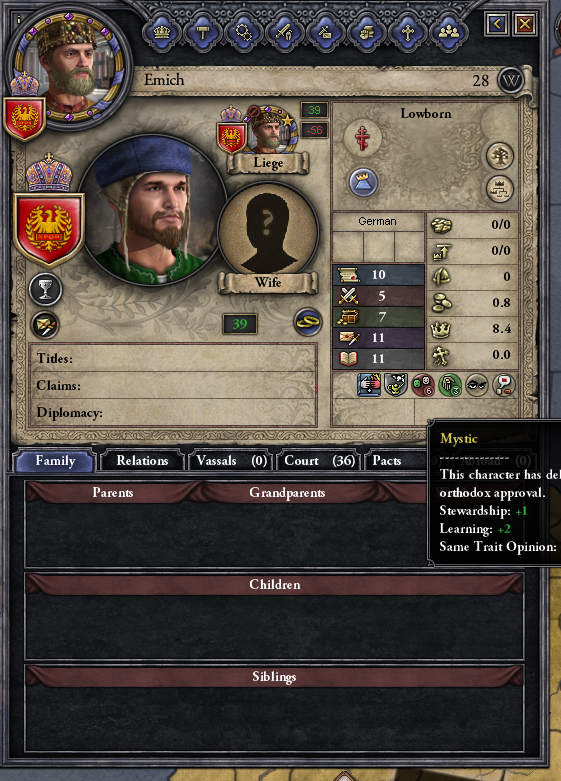 I’m sure he’s just as good as the crazy dwarf, right? 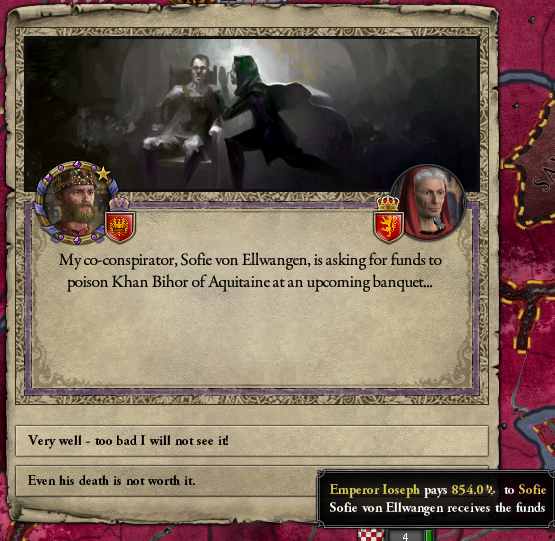 Well, though he only lived to be 56, Ioseph had a good run. 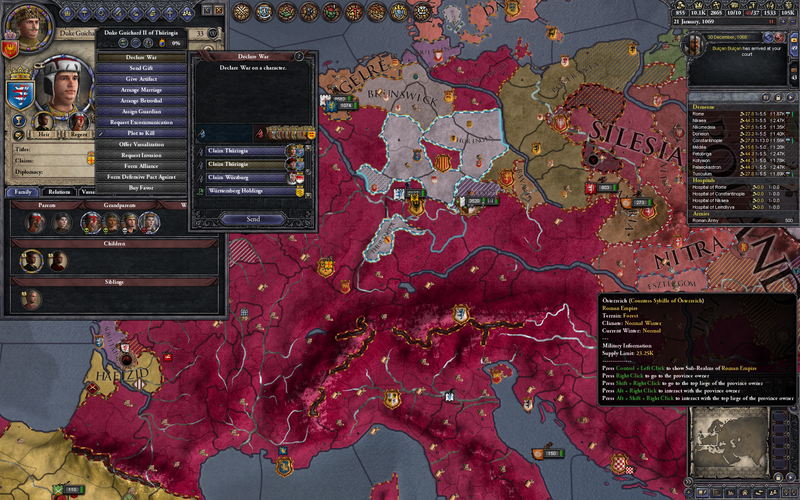 With Jesus’ help he led the legions to victory, vastly expanding my domain in both the east and west. 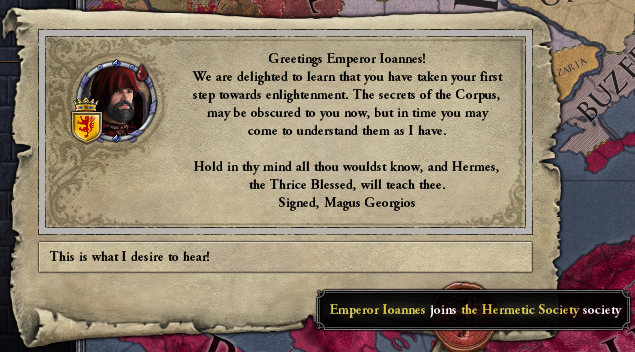 Ioannes is 24, with excellent stewardship and martial but lackluster diplomacy, which causes problems with his vassals. 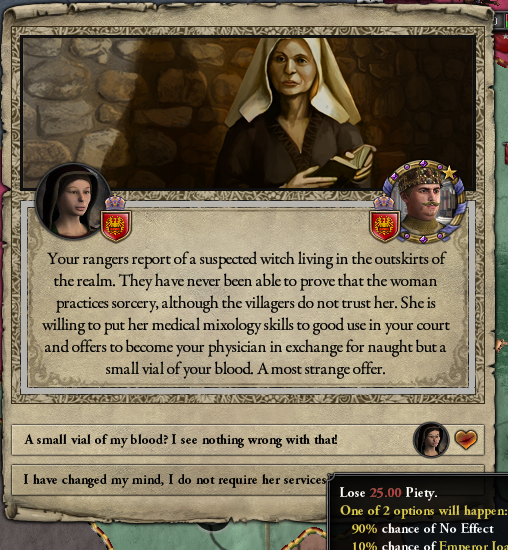 He hires a witch to be his doctor! 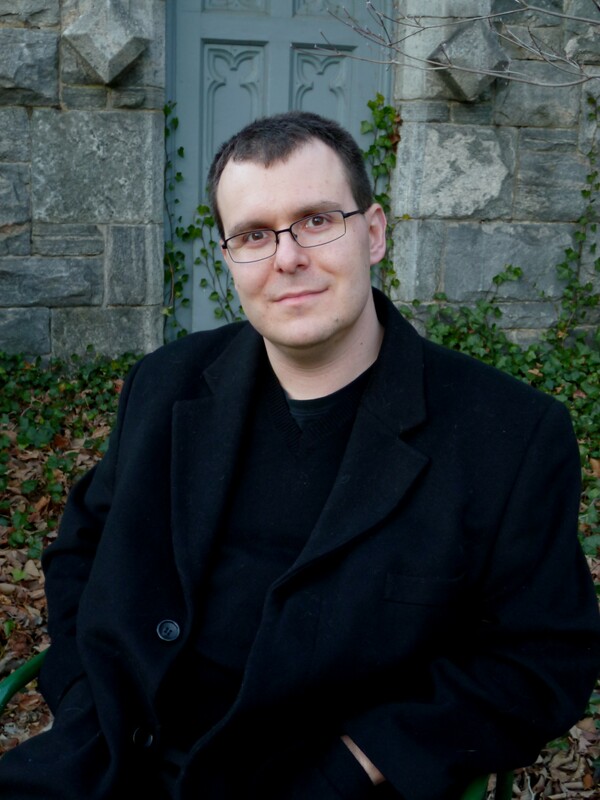 The witch gets married and leaves him in the lurch. 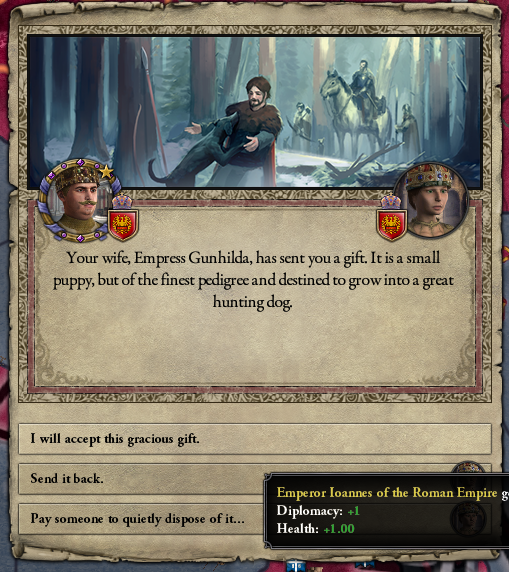 His wife gets him a dog! 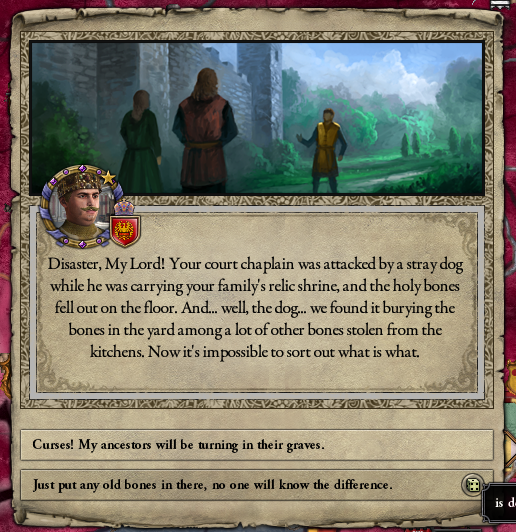 The dog eats the holy remains of John the Baptist. And the peasants are revolting. 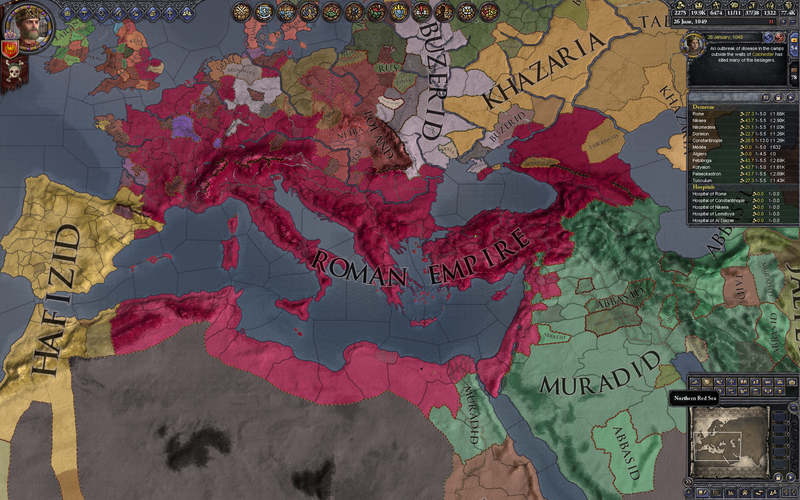 Good times in the Roman Empire. 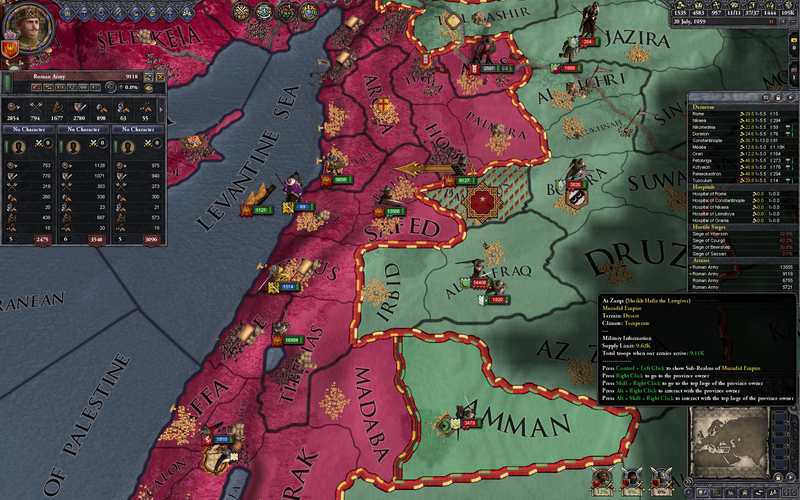 Once they’re dealt with, another holy war secures this annoying green dot in the middle of my field of peaceful red. 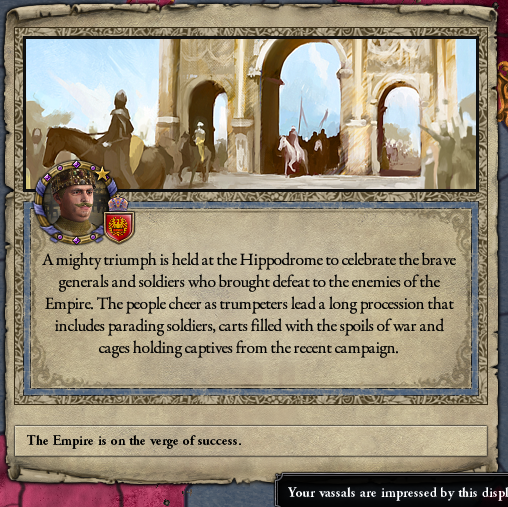 The vassals are unhappy with the new emperor, as usual. 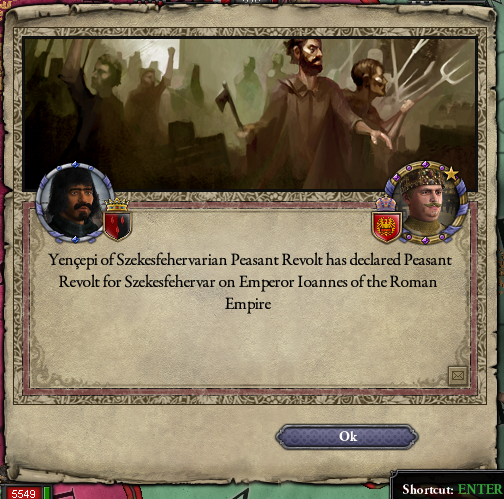 Commence the traditional revolt sequence! Except, somehow, it doesn’t happen! 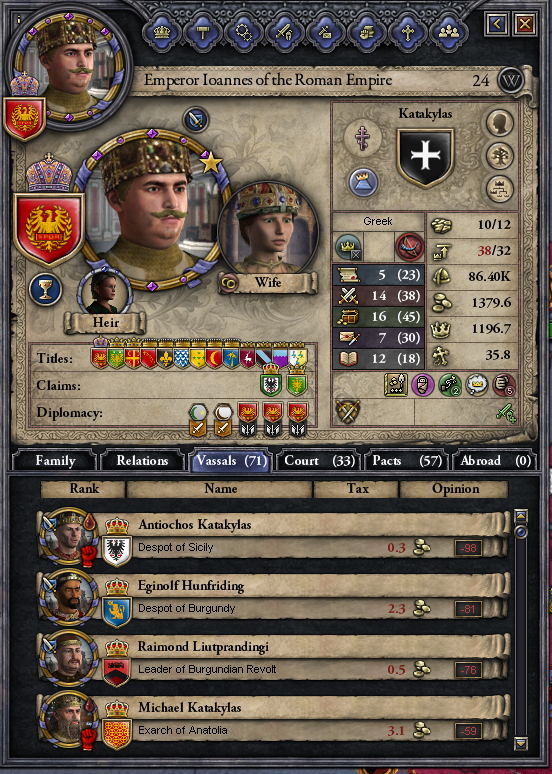 I imprison a few nobles and my Mystikos gets the rest under control. Score! 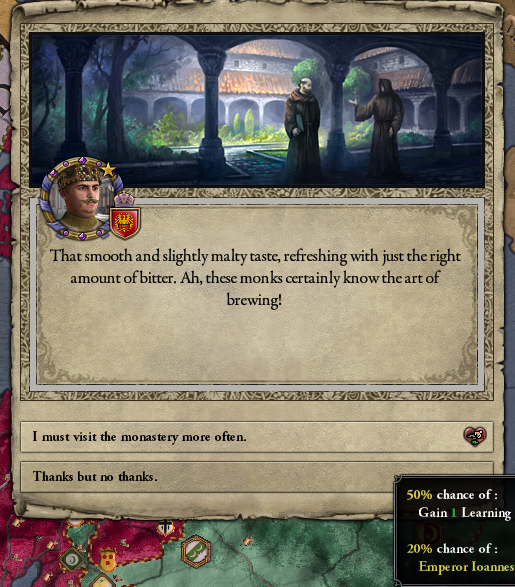 To celebrate I hit the monastery. Drunken sot?! Come on, I had one beer. Drunken or not it’s time to take more territory off the Hafizids. This is becoming more or less routine at this point. Creeping ever closer to Gibraltar. 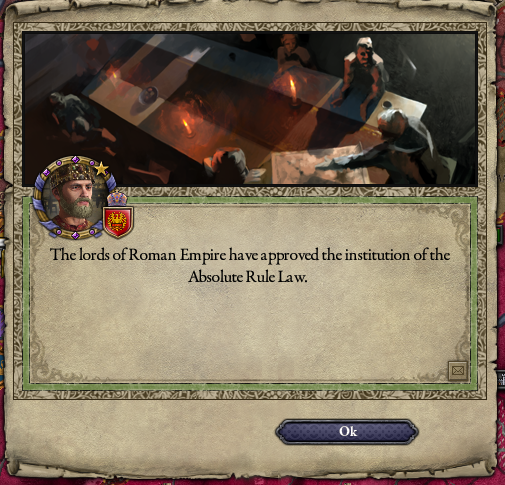 Then the nobles decide they do want to revolt after all! 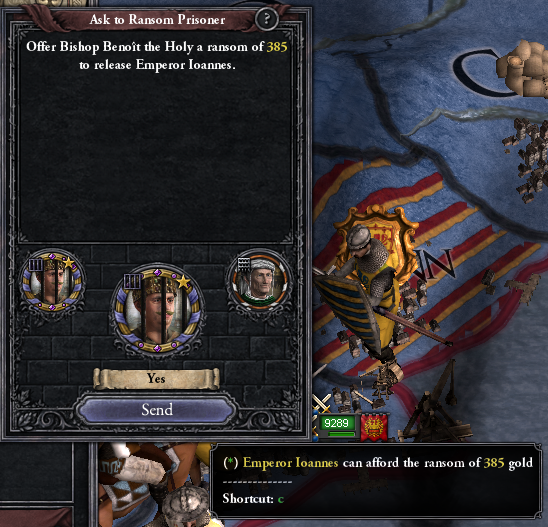 At least they politely waited for me to be done with my war. That’s, what, four kings and four dukes? I can take ’em! 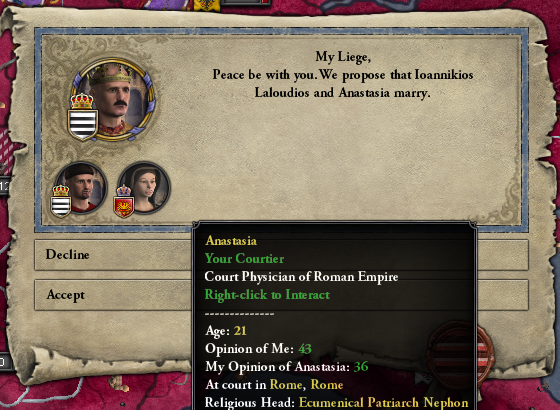 These civil wars are getting to be somewhat large affairs! But I bring the rebels to their knees and peace is soon restored. Oh come on. I refuse to believe there’s such a thing as a Szekesfehervarian. 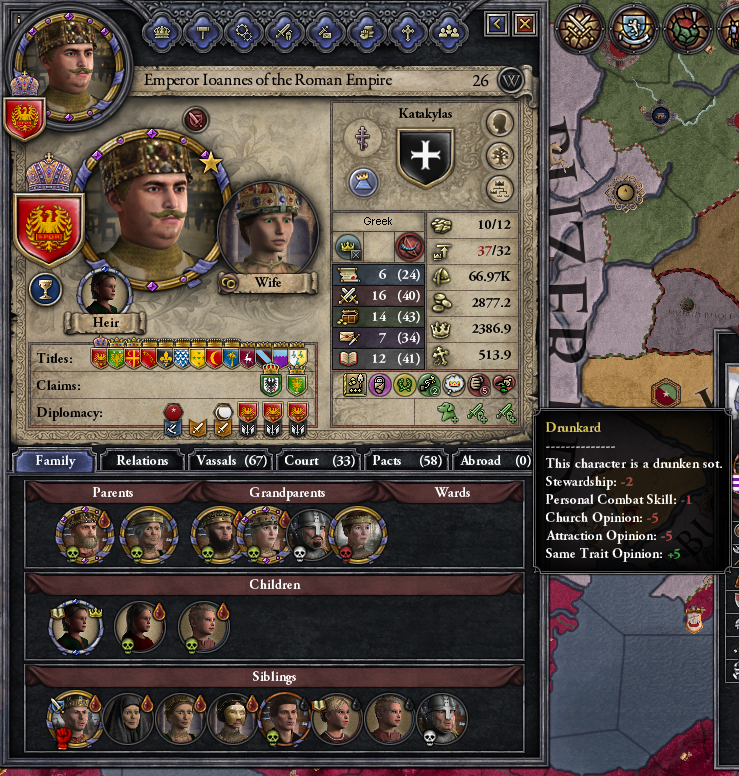 Emperor Ioannes is feeling sorry for himself. 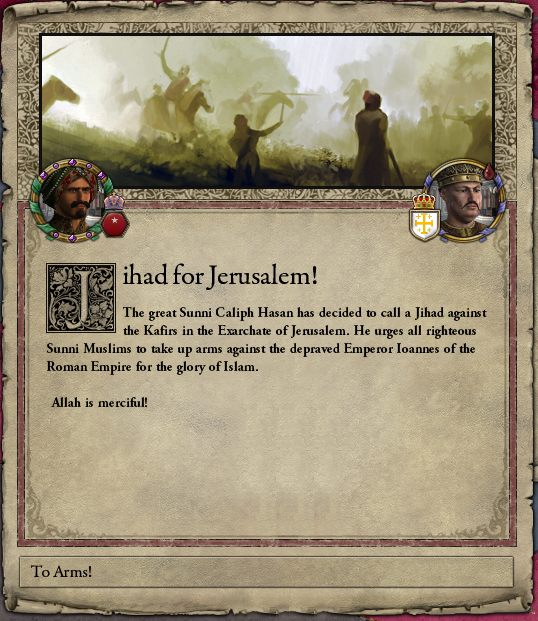 The bad news is that the Muslims have gathered a huge army. The good news is that they can’t feed it out in the desert, so I just wait around for them to starve to death. Once they’re whittled down to a more reasonable size, I jump them. 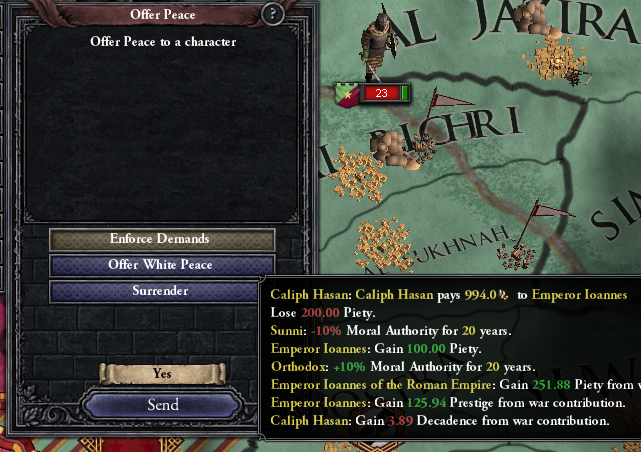 Eventually, the Caliph pays up to end the war. 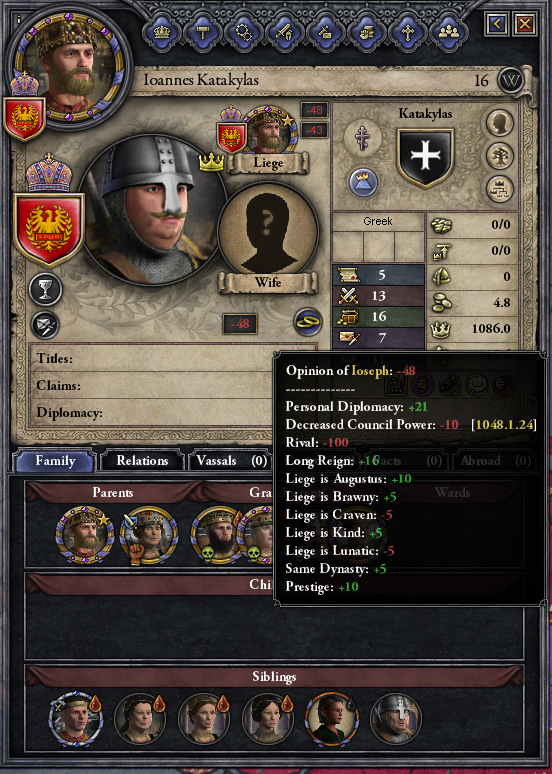 At 34 Ioannes is a crappy diplomat, but still improving as a general. No word yet from Jesus though. 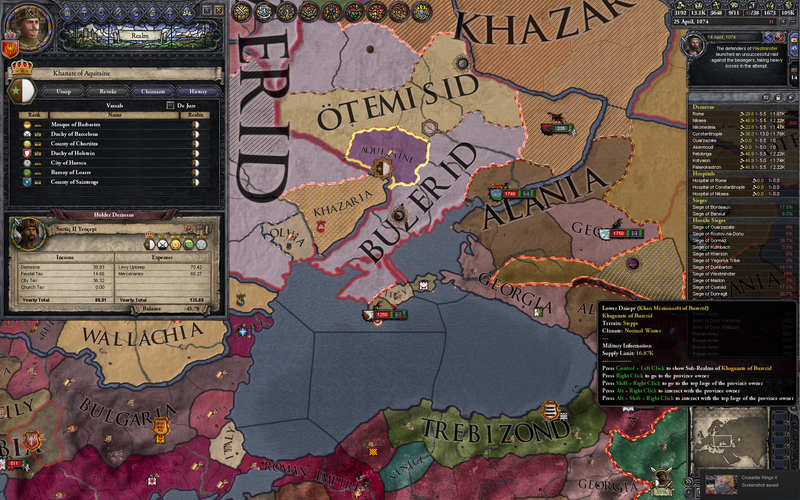 A Hafizid revolt gives me a chance to blitz some more territory in the west. About time I did something about this ugly purple blotch, too. Brittany is next on the shopping list, along with another chunk of Egypt. 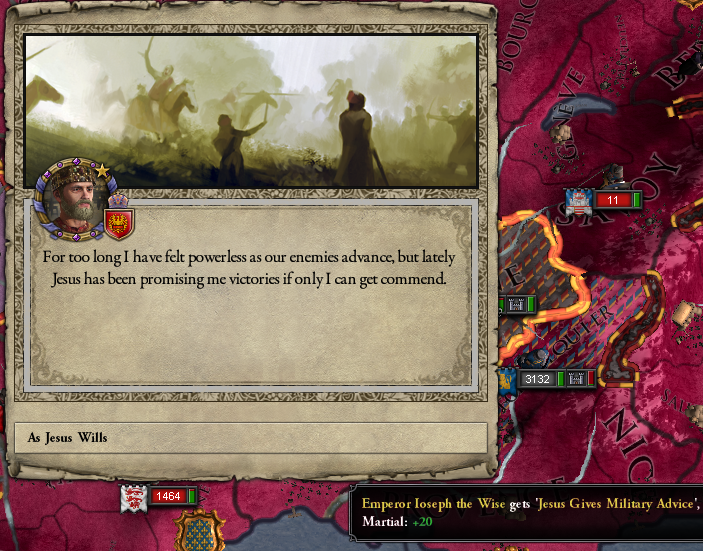 I lose so few troops in these wars I can run them continuously, letting the levies of some vassals recover while I use others to fight with. 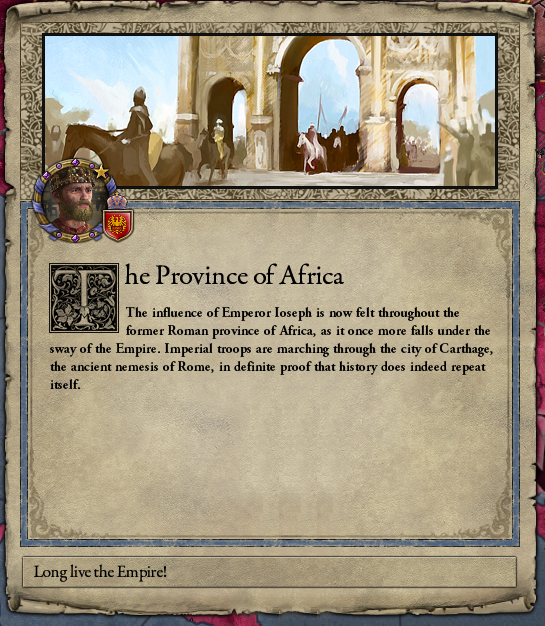 Italy, France, and Africa are all good sources of troops. 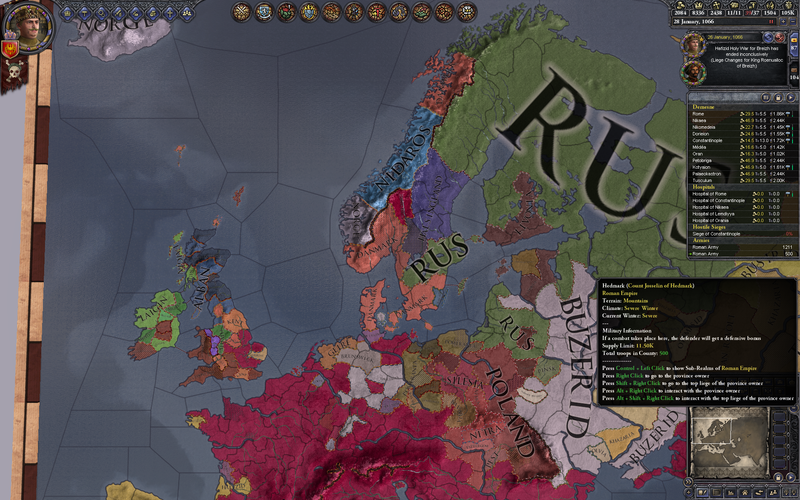 My vassals have been pushing at the northern border, too, including grabbing a random county in the middle of Scandinavia. 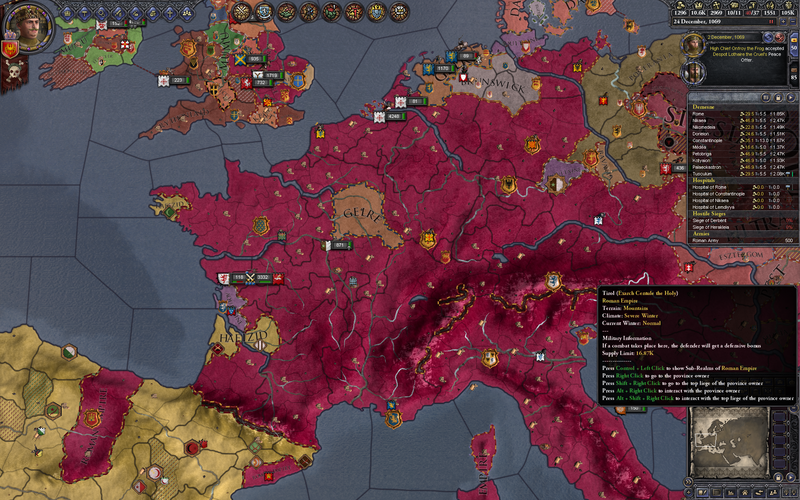 The cleanup of Gaul continues with Loon and Alsace, where nothing bad will ever happen again. Another war with the Hafizids follows. Almost to the coast! 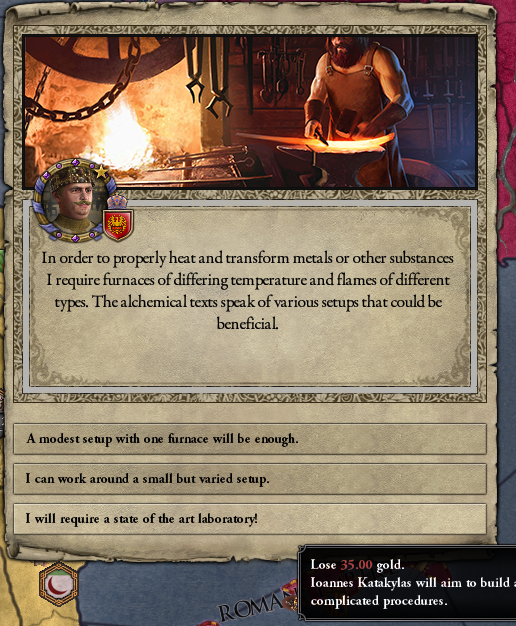 Meanwhile, as a distraction from constant war, Ioannes has decided to become an alchemist. This is another secret society, though a little less malicious than the Satanists. 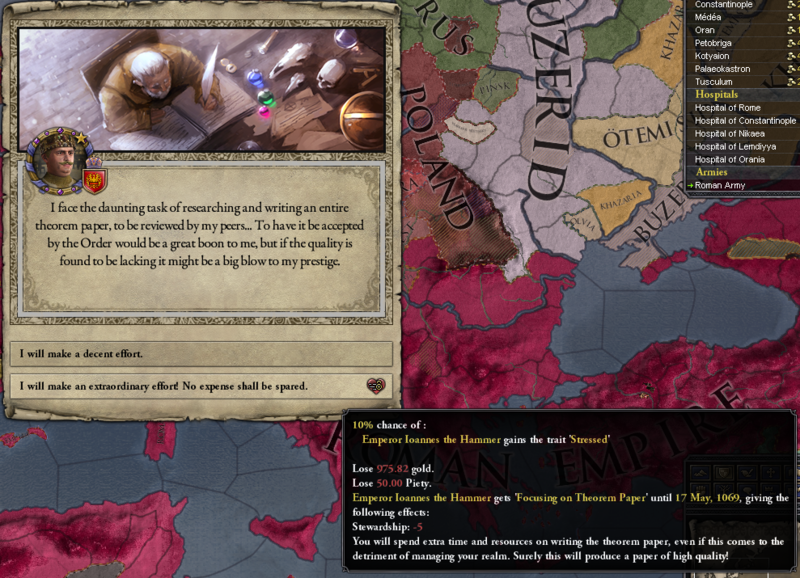 Now he must face his most difficult opponent: a term paper. 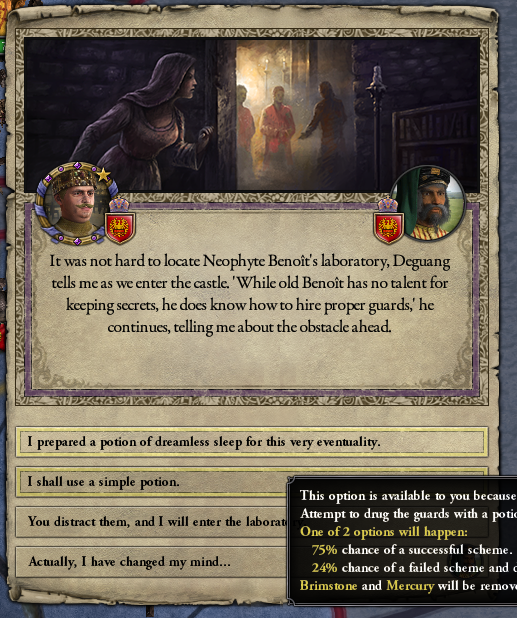 When building a laboratory for esoteric science, it helps to be richer than God, which I now am. On the war front, I’ve managed to enlist a claimant to the duchy of Thoringia, which will go a long way toward cleaning up northern Europe. I am the Emperor. (And my prestige is over 10,000.) I don’t accommodate anybody. 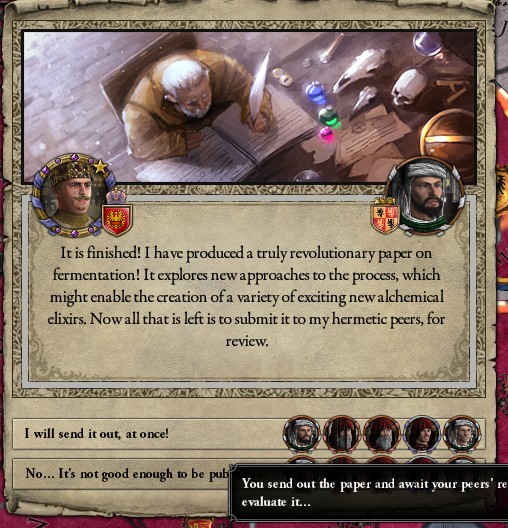 I have prepared a paper on … fermentation. It will help with the preparation of, um, alchemical elixirs. Are they buying it, bro? WOO they bought it! Barkeep, another round of alchemical elixirs! 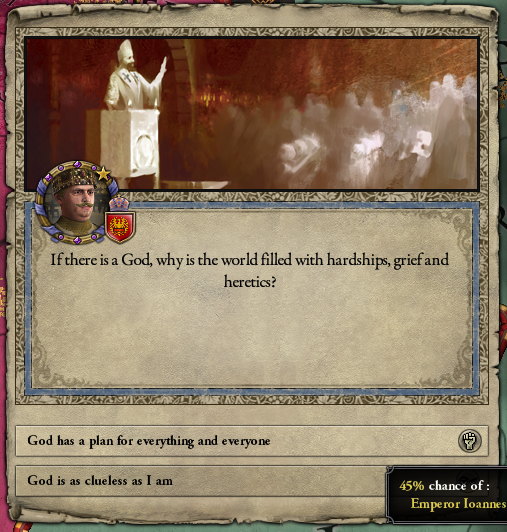 I’m Emperor of, like, the world. Can’t I tell them not to do this? Thoringia falls, pushing my northern border up to the Baltic Sea. 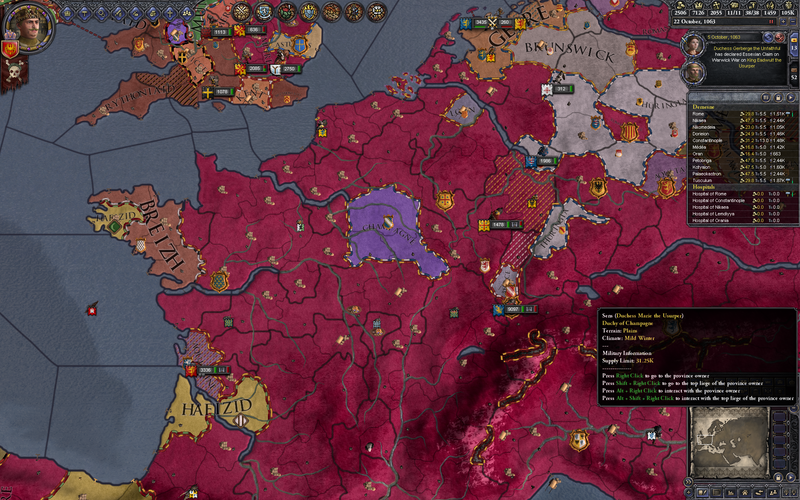 Then somehow the Duke of Gelre (that brown bit next to gray Brunswick) inherits Paris? That shouldn’t be legal, but who knows. 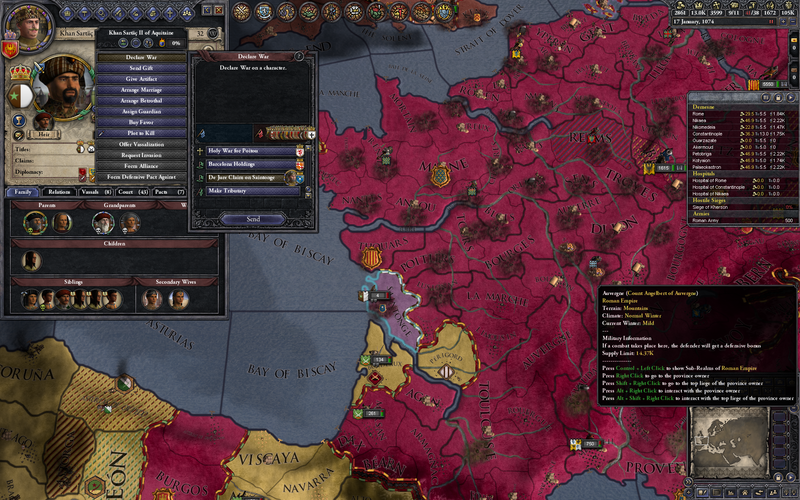 Fortunately, this is not a catastrophe, since my vassal King of France gets a claim on Gelre in return. 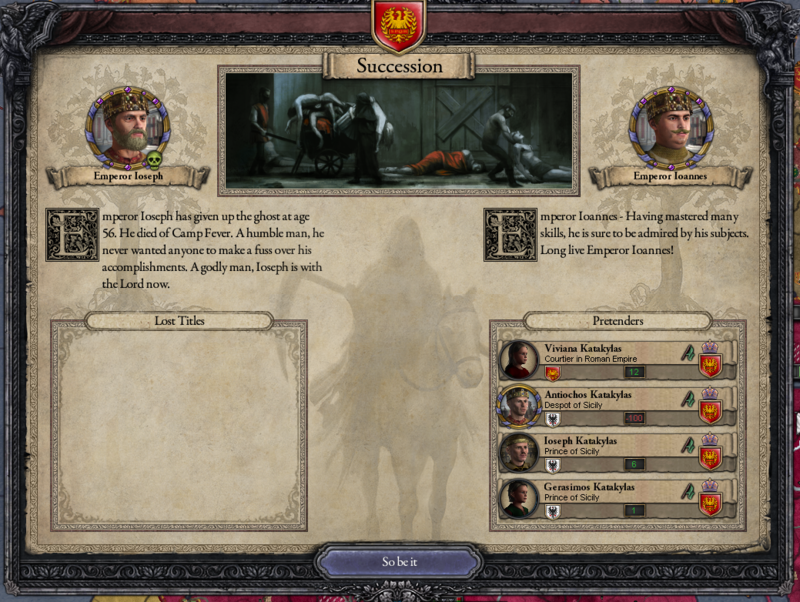 A quick assassination takes the King of Gelre out of the game, putting a child on the throne. And I take both territories back in the counter-attack. 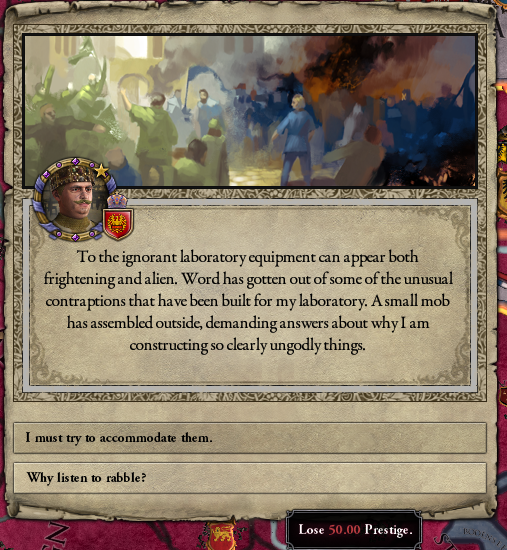 Fortuitously, a claimant to the Kingdom of Alban drops into my lap, and I launch a war for that even though it’s really beyond the old borders of the Empire per se. 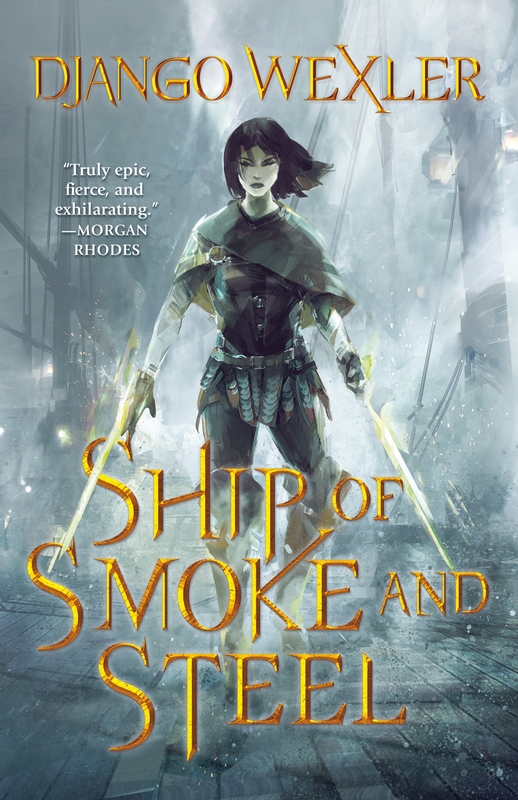 Ioannes, though, is more concerned with his alchemical shenanigans, breaking into a rivals library to steal his secrets. This goes poorly. 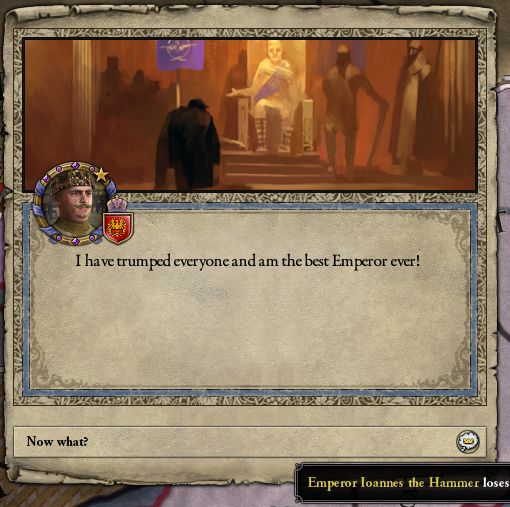 You’d think “I’m the Emperor!” would be a pretty good trump card, but apparently not. Fortunately, he’s willing to let me go for a sack of gold. And Alban has fallen. Soon it’ll be time to get serious about occupying the rest of Britain, which will not be terribly difficult. First, though, another stab at the Hafizids gets me, finally, to the west coast of Africa. 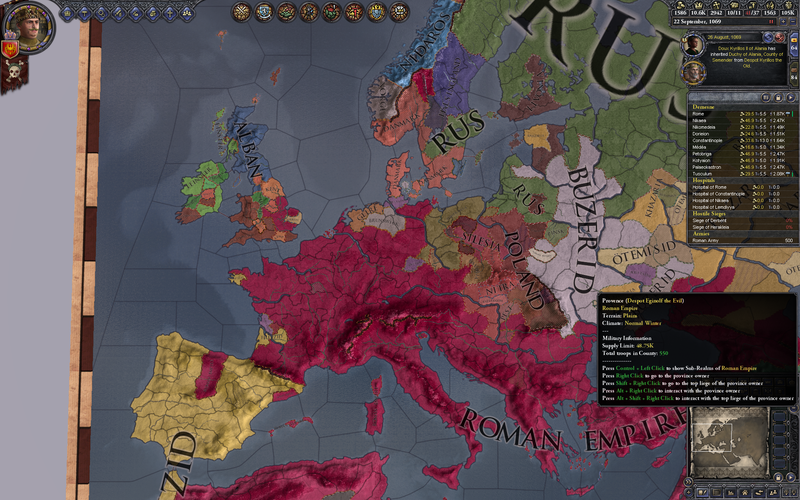 They’re weakening — hopefully soon they’ll be small enough my vassals can bite off pieces. 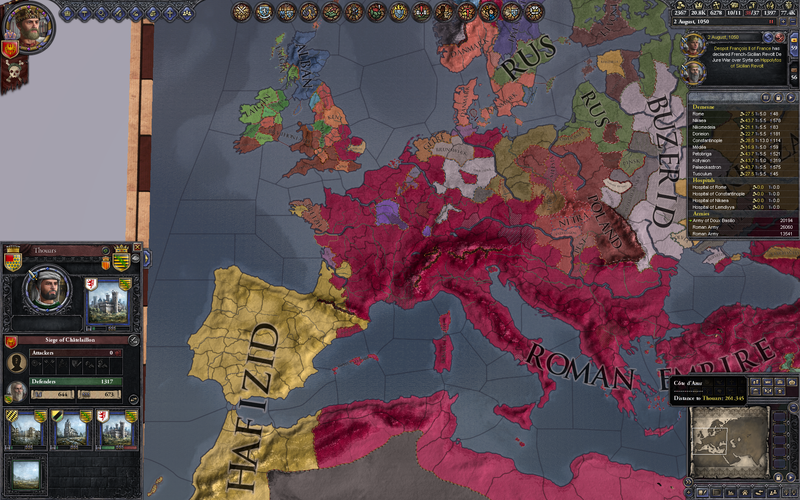 A simple war to grab this purple county in Gaul turns out to be much more annoying than I planned. 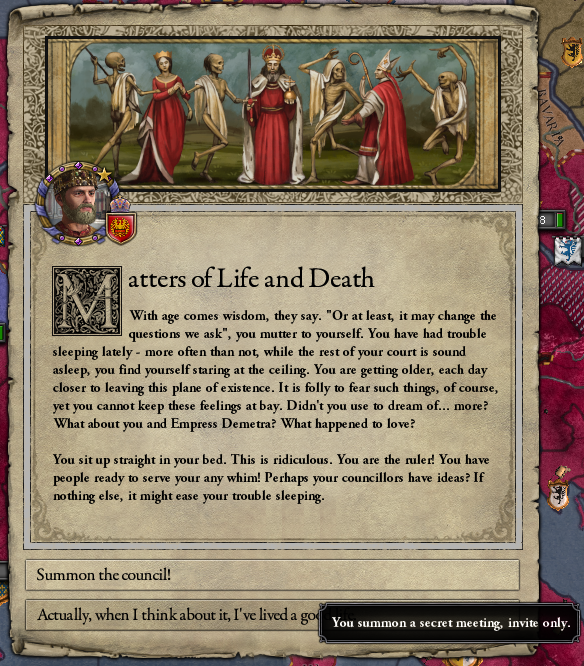 This is partially because France has the plague. 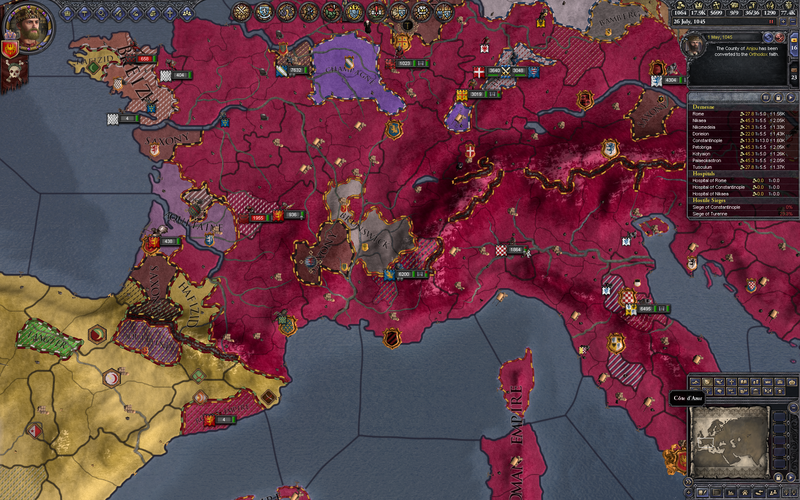 Mostly, though, it’s because this is what’s left of Aquitaine, which now consists of like four randomly scattered counties all over the world. So subduing each one (while the rest of the world fights me) is a bit of work. 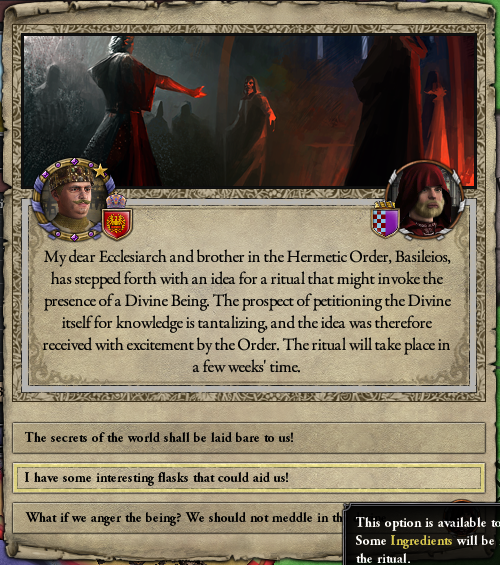 But we’re going to petition the Divine Being! I have some … interesting flasks … of elixir? I hope the Divine Being likes Bud Light. 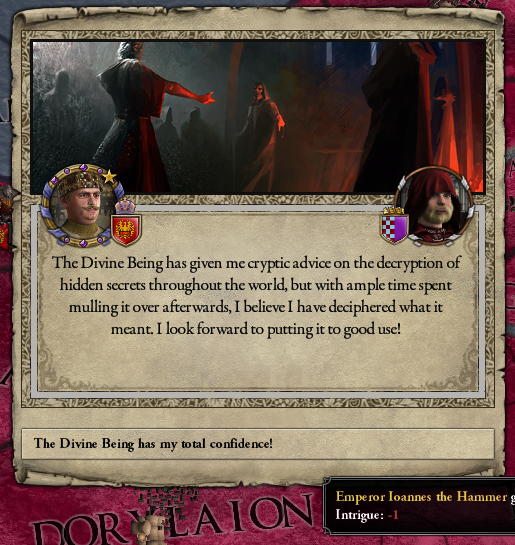 The Divine Being proves less than completely helpful. Should have given him the box wine instead. 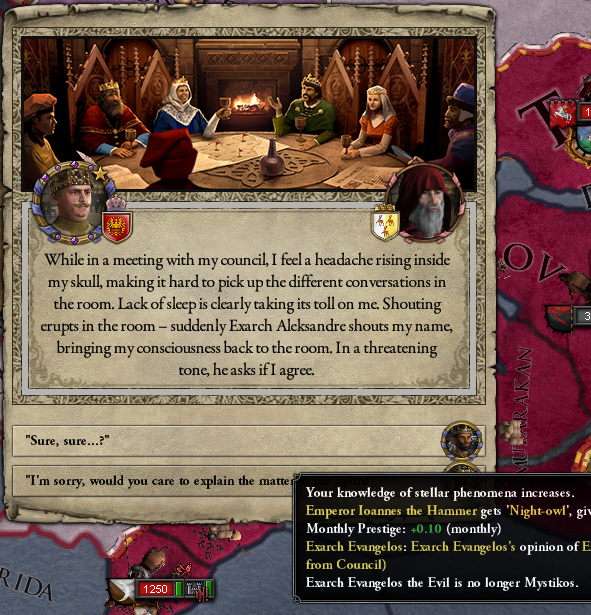 I’m so busy stargazing that I drift off in a council meeting, and when I wake up I’ve fired someone called Exarch Evangelos the Evil. So that’s probably a net win. 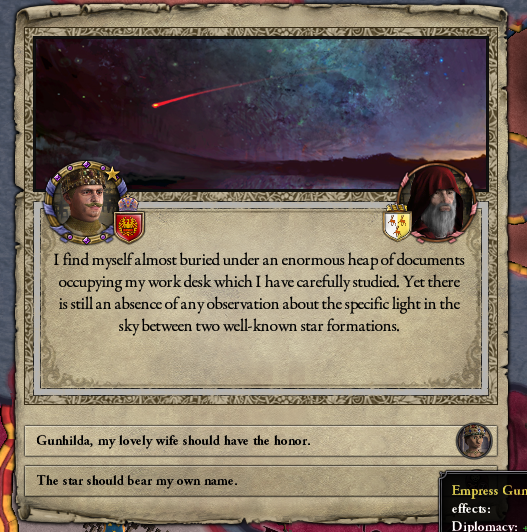 Finally, Ioannes discovers a new star, which he generously names after his wife instead of himself. He is extremely pleased with this result. 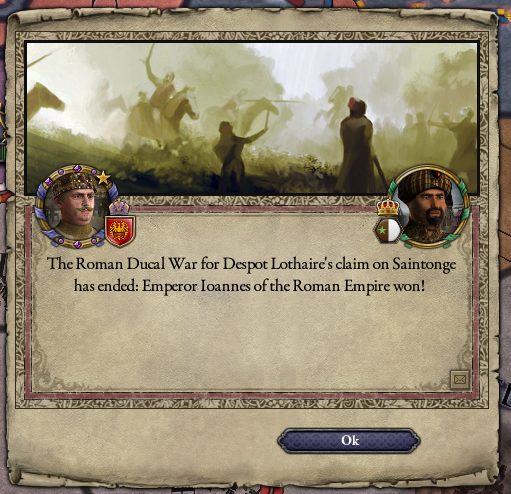 And the war against Aquitaine finally, finally ends! 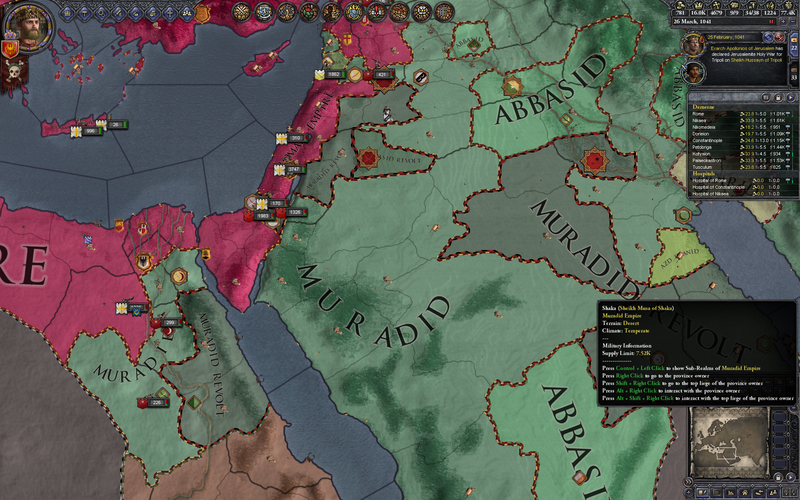 I celebrate by starting a war against the Muradid Empire, which is ironically much easier. 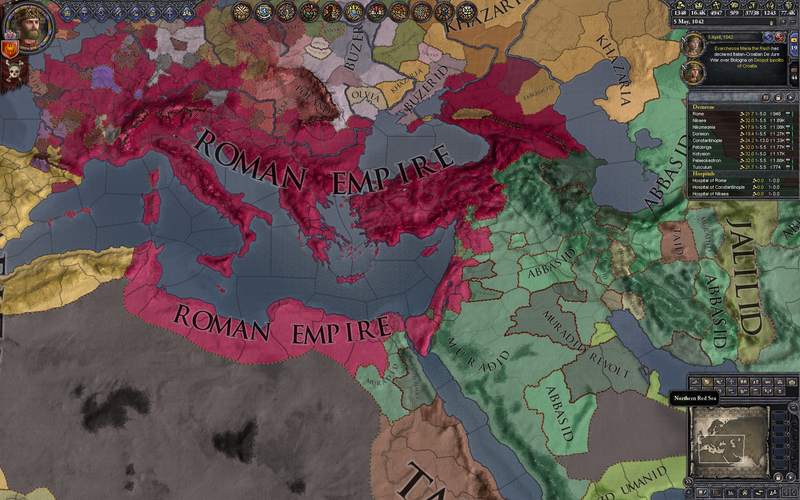 Roman power is now pushed all the way to the southern border of Egypt! 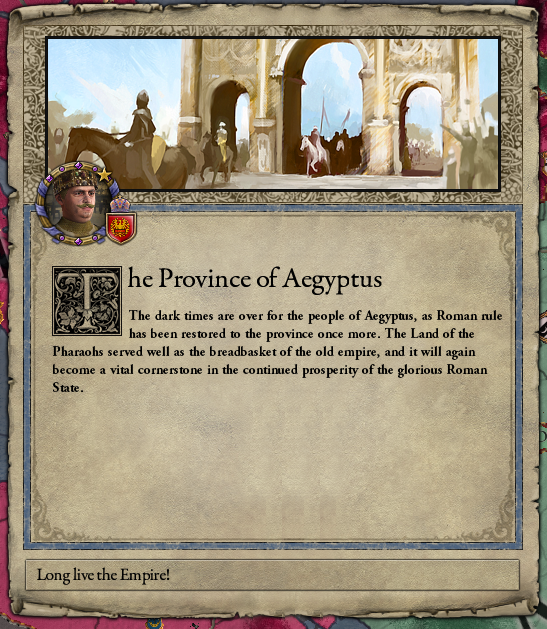 And another ancient province is reclaimed for the Empire. Getting there!